For every day of his presidency—657 so far, if you’re counting—the issue of Donald J. Trump’s ties to Russia has darkened the Oval Office door. Since May 17, 2017, when former FBI director Robert S. Mueller was appointed Special Counsel to unravel Trump’s secret Kremlin linkages, the president has seethed, his rage seeping into his tweets. From its first day, President Trump has wanted to quash the Mueller investigation, and now he’s making his move. But is it already too late? There’s mounting evidence it is, specifically that Team Mueller is ready to strike imminently with indictments, no matter what the White House does. All the same, the feat was impetuous even for Trump. He could not wait even one day, dropping his bomb on Wednesday afternoon, on the heels of his wild, angry press conference about the midterm elections. Although Tuesday’s midterms were hardly the personal success that Trump presented them as—with the Democratic takeover of the House muted by GOP gains in the Senate—the hotly desired Democratic Blue Wave never quite swelled. The midterms were a setback for the White House, but hardly an unprecedented one. Barack Obama in 2010 and Bill Clinton in 1994 took worse midterm hits and got reelected. Nevertheless, only 18 hours after polls closed, President Trump cashiered his attorney general, Jeff Sessions, the cabinet’s most sincere Trumpian true believer. The move was long overdue; indeed, Sessions’ survival this long seems miraculous (that the attorney general’s strange forced-resignation letter lacked a date was the tell). Sessions committed the unpardonable sin in Trump’s eyes of recusing himself from the Russia probe, an act commonsensical for any attorney. By finally getting rid of the hated Sessions, Trump opened the door to shutting down the Mueller investigation. The president cares nothing for precedent or rules, yet even for Trump what happened on Wednesday was a brazen act which seems destined to force a constitutional crisis. Not content with pushing Sessions aside, Trump shoved Rod Rosenstein, the dutiful deputy attorney general who has overseen the Mueller probe, out of the way too. Rosenstein is still in his job, for now, but he has been removed from any role in the Mueller inquiry. There went the last bureaucratic top-cover for Team Mueller. Trump then outdid himself by appointing as acting attorney general Sessions’ chief of staff, Matthew Whitaker. At the Justice Department, Whitaker is disliked as a Trump crony who is qualified, barely, to be the attorney general, being a former Federal prosecutor in Iowa. However, Whitaker is also a critic of the Mueller inquiry, indeed a vehement one, who has advocated limiting and even shuttering any investigation into the president’s ties to Moscow. By any normal legal standards, Whitaker should immediately recuse himself from anything touching the Special Counsel’s office, but these are not normal times in our nation’s capital. Whitaker was chosen by the White House to fix the president’s Mueller problem by any means necessary. Whitaker’s own highly partisan and less-than-ethical past indicates that, for once, President Trump may have chosen the right man for the job. Conservative legal celebrity John Yoo weighed in just as harshly. 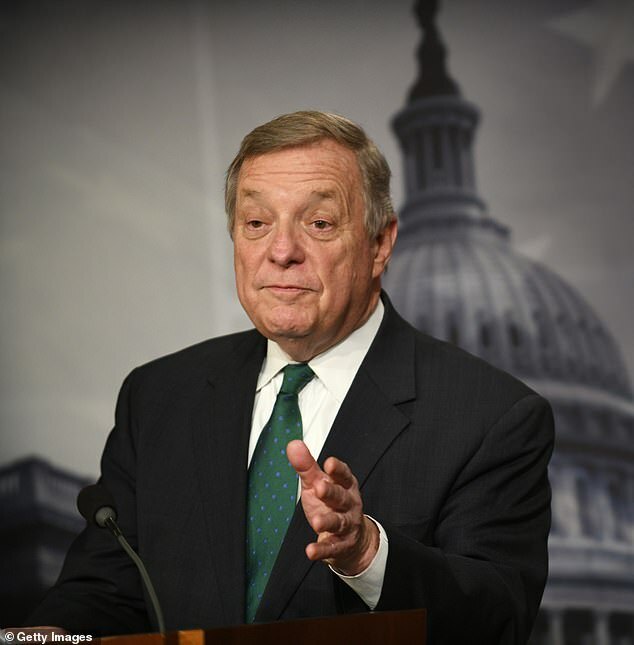 Reviled on the Left for his fierce defense of President George W. Bush during the bumpiest years of his administration, Yoo flatly denounced as “unconstitutional” the current White House effort to let Whitaker kill the Mueller inquiry as acting attorney general. If Trump wants Whitaker to do that, the nominee will need to pass Senate approval. That’s a high-stakes gamble, and if the White House has any sense it will back off quickly before they have created a bona fide constitutional crisis there’s no way out of. That said, Trump may want a major crisis to buy time before Team Mueller drops indictments on the president, his relatives, and his retinue. To abide by Justice Department rules, Mueller went silent for almost two months before the midterms, to avoid any appearance of election interference, but the Special Counsel’s office is now renewing the public side of their investigation. Team Mueller is reported to be working on the final draft of their report on the president and his Russian ties in 2016. Whatever that report says, it’s not likely to be flattering to Team Trump. Worse for the White House, Mueller’s prosecutors are widely believed to be closing in on two people close to the president, Roger Stone and Donald Trump, Jr. Stone, the self-proclaimed Republican “ratf*cker,” has spoken openly of his fears of impending indictment over his links to WikiLeaks in 2016. Don Jr. is reported to be concerned as well, since he appears to have lied to Federal investigators about the fateful June 9, 2016 Trump Tower meeting with Russian intelligence officials. Indictments of Stone, a friend of the president since the 1970s, or worse Trump’s son and namesake, seem certain to push the White House into greater paroxysms of rage. What might happen then is anybody’s guess. Trump’s desperation to shut down the Mueller inquiry before it cuts very close to home is therefore understandable. It’s also a fool’s errand. In truth, it’s far too late to shut the Special Counsel down altogether. Mueller and his staff, veterans of Beltway wars, were not surprised by this week’s events. They were prepared. Any efforts by Acting AG Whitaker to block indictments will go public quickly and throw Washington into deep crisis. For Trump, there are no exits or off-ramps left. When Mueller informs the public of more indictments is an open question. That they are coming, however, is not. And there are lots of them. The Special Counsel has been at work for almost 18 months now. An Intelligence Community official who assisted the Special Counsel’s investigation told me this week that Team Mueller is holding “dozens of sealed indictments” of people associated with the president, his 2015-16 campaign, and his administration. “Nobody who’s close to the Russians is getting out of this,” said the IC official. When will those indictments start being unsealed? Watch this space. 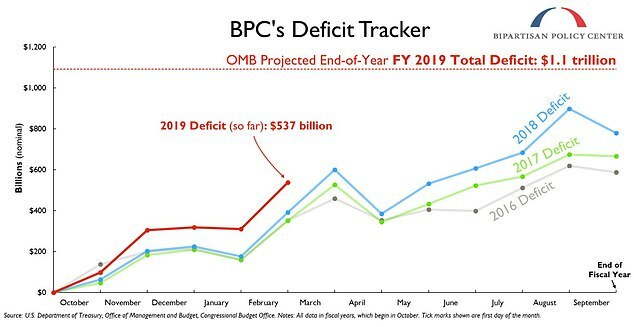 According to the forecast, this year's deficit will be the largest imbalance since the government had a $1.1 trillion deficit in 2012. 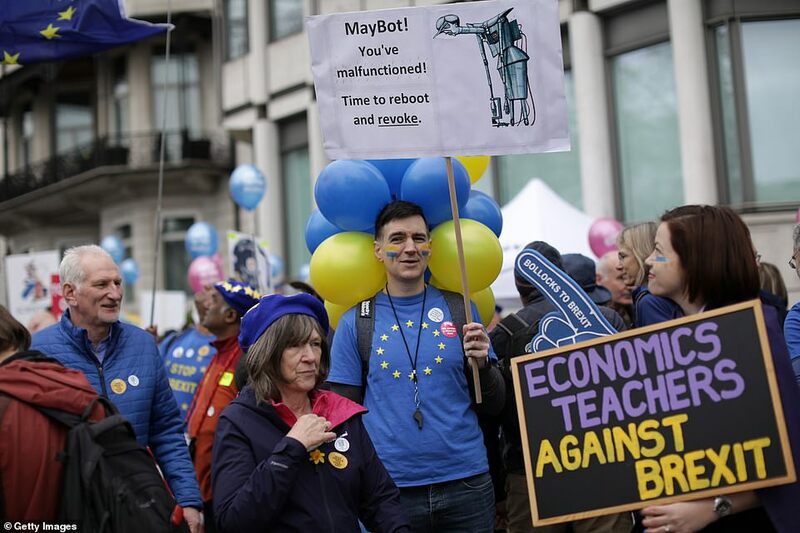 That was the fourth straight year of trillion-dollar deficits during a period when the Obama administration had boosted spending to grapple with the 2008 financial crisis and lift the country out of the deepest recession since the 1930s. Critics of the administration's economic policies blame the bigger deficits on the $1.5 trillion tax cut for individuals and corporations that the administration pushed through Congress in December 2017. They also cite billions of dollars in increased spending on the military and domestic programs that Congress approved last year. 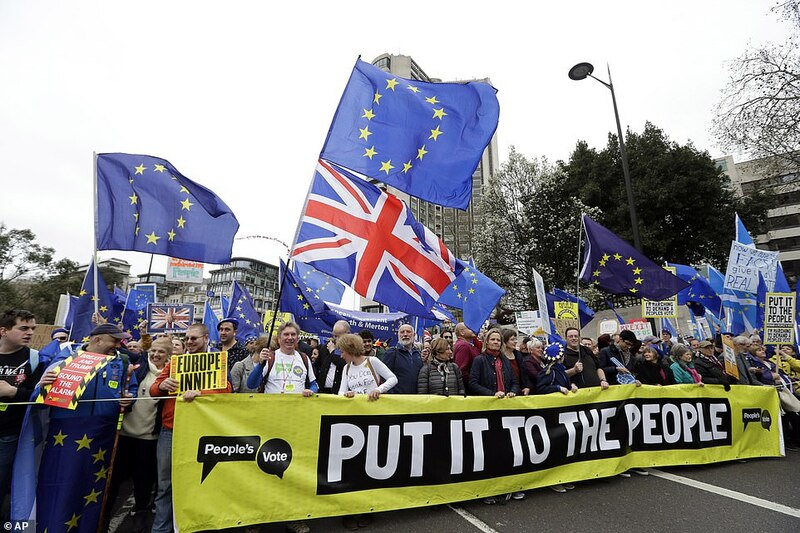 Anti-Brexit protesters have travelled from all over the country to London for the 'Put it to the People March' as the online petition urging the government to cancel Brexit passed four million signatures. 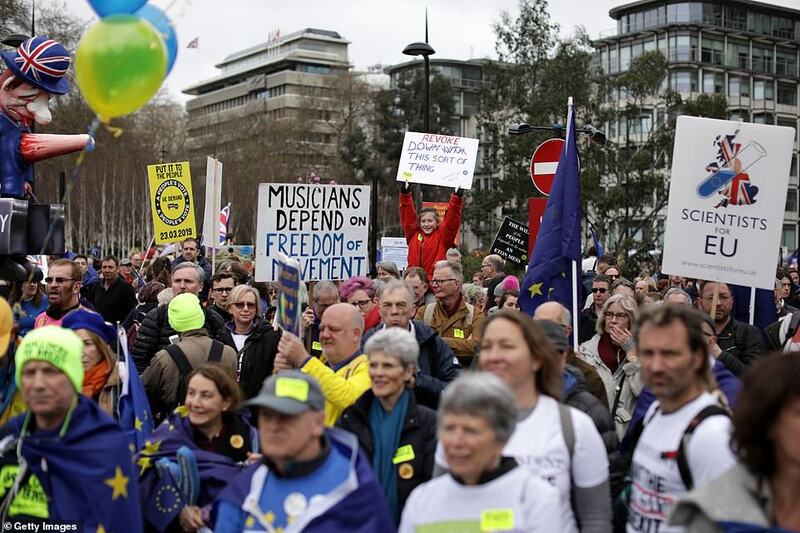 Opponents of Britain's departure from the European Union began gathering in Hyde Park from 12pm before converging on Westminster and organisers claim a million people turned up to voice their concerns over the decision to leave the EU. 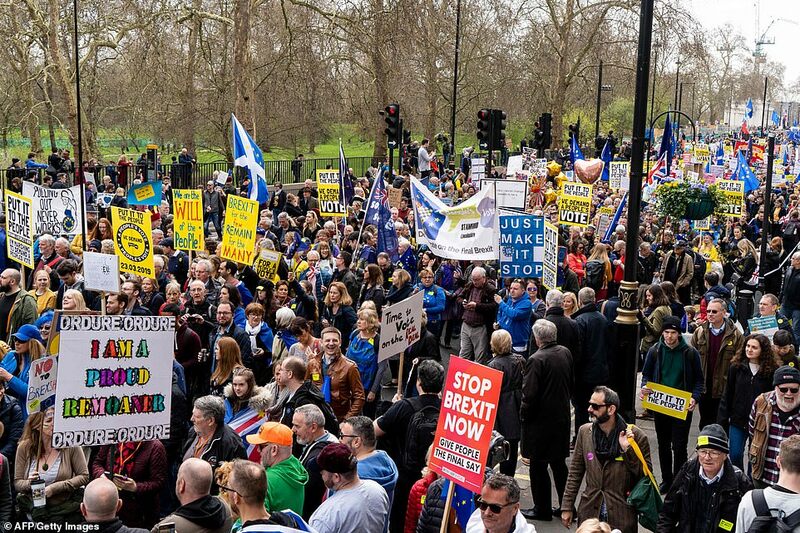 Speakers set to address a rally outside Parliament include Scotland's First Minister Nicola Sturgeon, London Mayor Sadiq Khan and opposition Labour deputy leader Tom Watson. 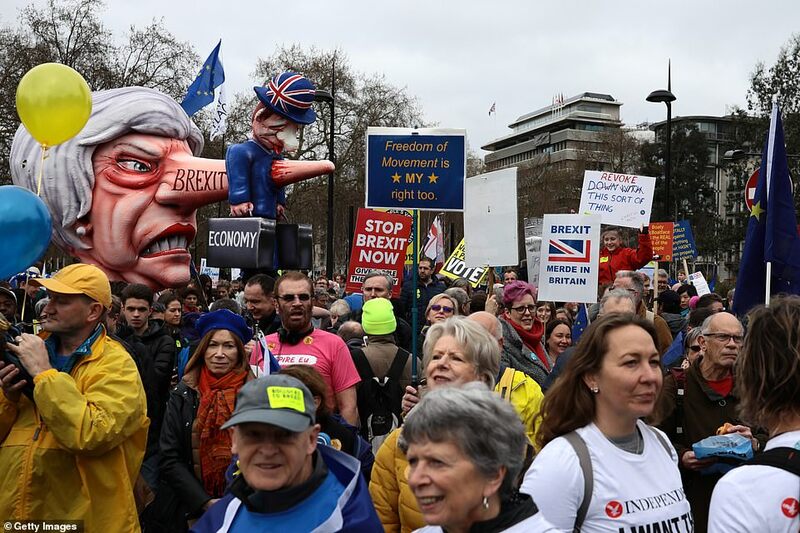 Organisers were confident that the size of the crowd would exceed a similar rally held in October, when supporters said 700,000 people turned up. 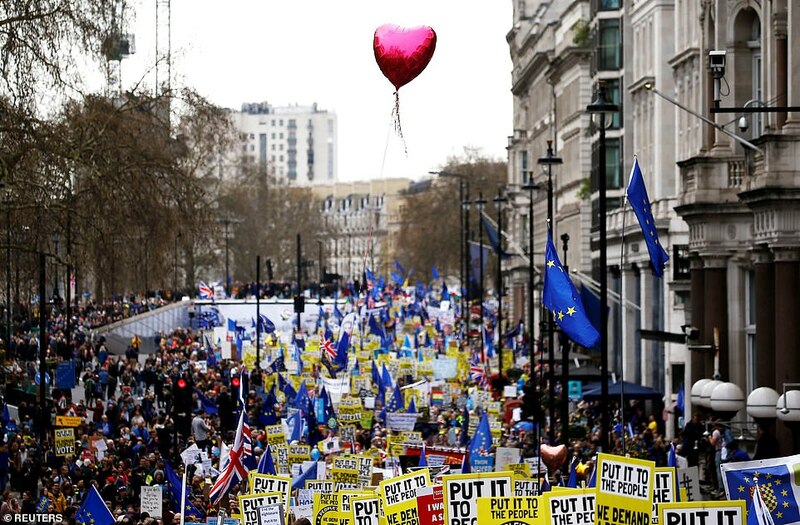 The Metropolitan Police refused to comment on the size of the march but organisers said a million protesters turned up to voice their anger over Brexit. 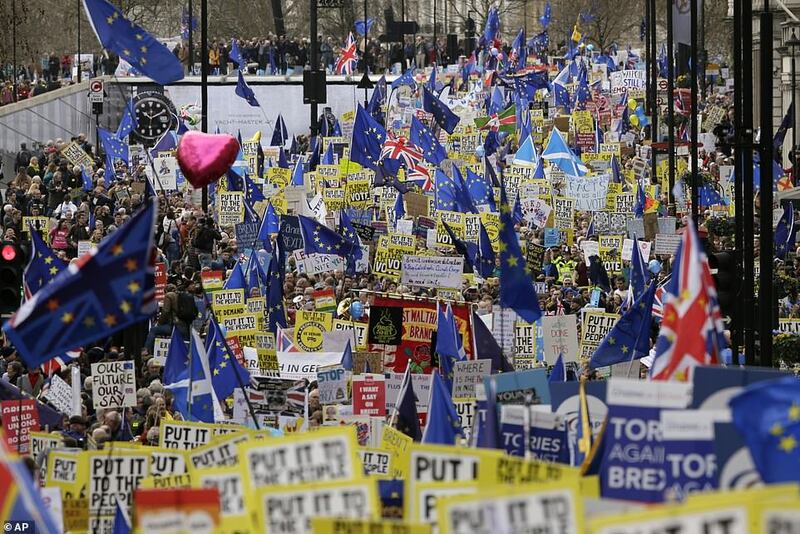 'Brexit is a complete and utter mess,' Khan said on the eve of the event. 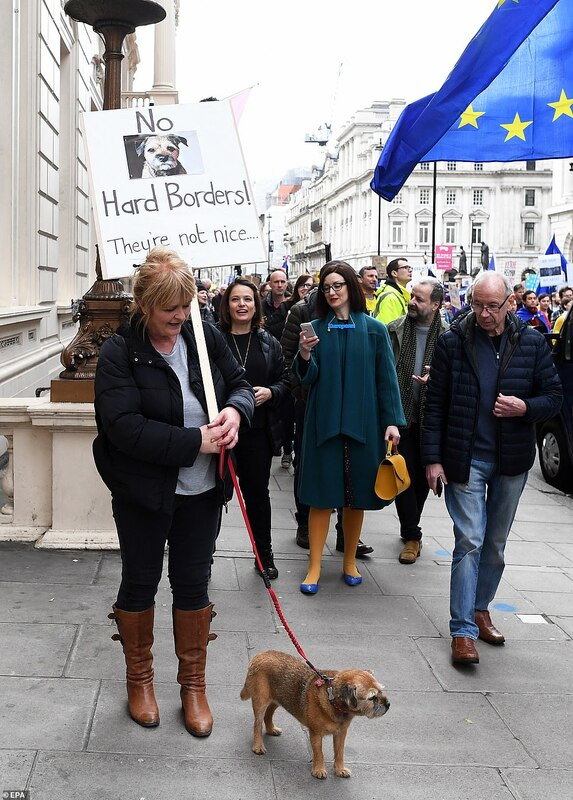 Earlier, former Ukip leader Nigel Farage joined the counter March to Leave in Linby, Nottinghamshire, telling around 200 Brexit supporters that Theresa May had reduced the nation 'to a state of humiliation'. 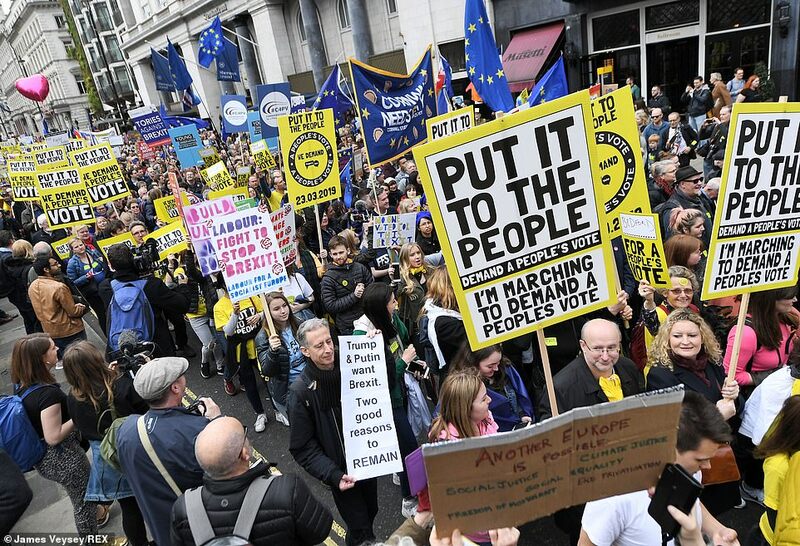 The 'People's vote' protest - set to be one of the largest in the capital in decades - is hosted by the People's Vote pressure group. 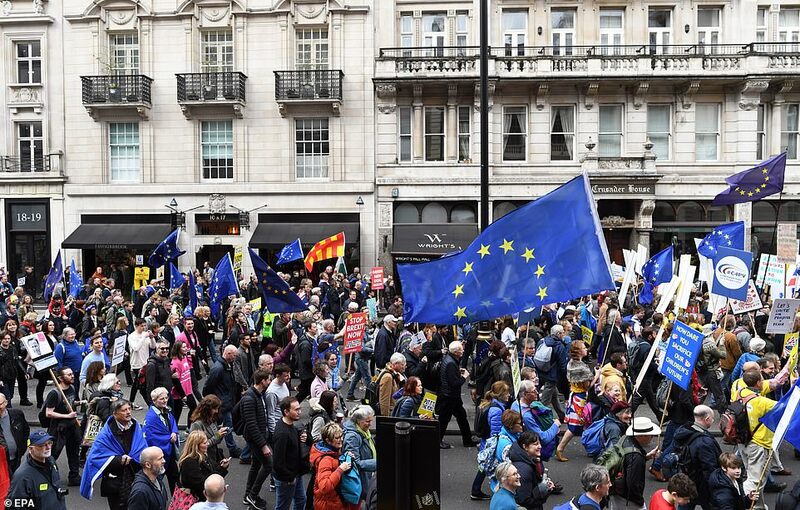 Saturday's protest follows a similar demonstration in October that drew an estimated half a million people. 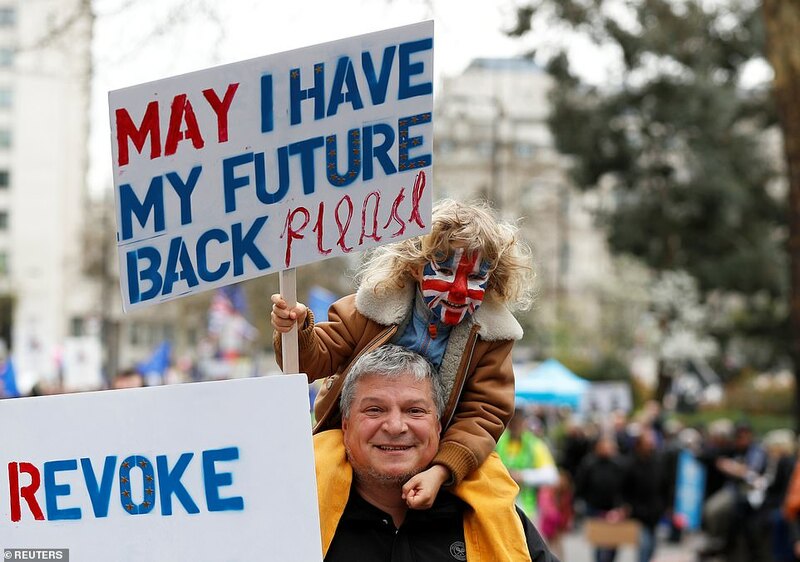 'I am an old man and the outcome won't affect me - but it will affect my family and many people that I know for years to come,' he said in a statement released by organisers. 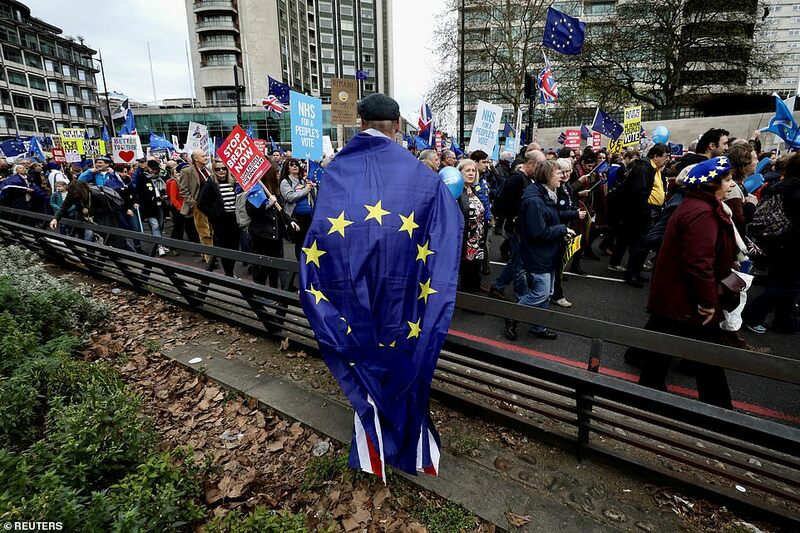 'The whole country isn't doing enough of that,' he said. 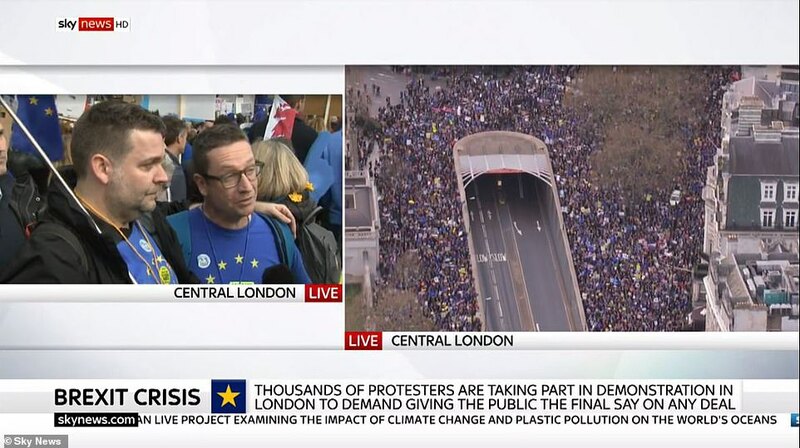 'People fear the atmosphere is very dangerous in this country,' he said. 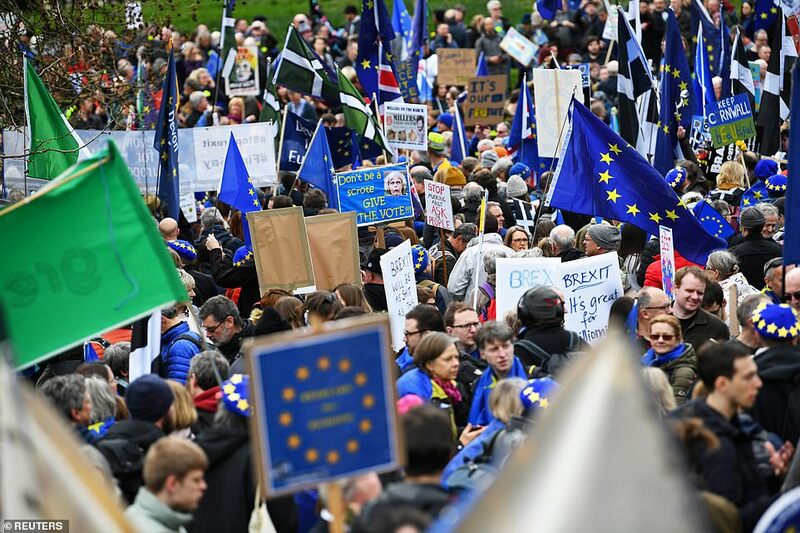 The protest comes after EU leaders this week granted a delay to Brexit, prompting Prime Minister Theresa May to make a renewed bid to win MPs' backing for her divorce deal. 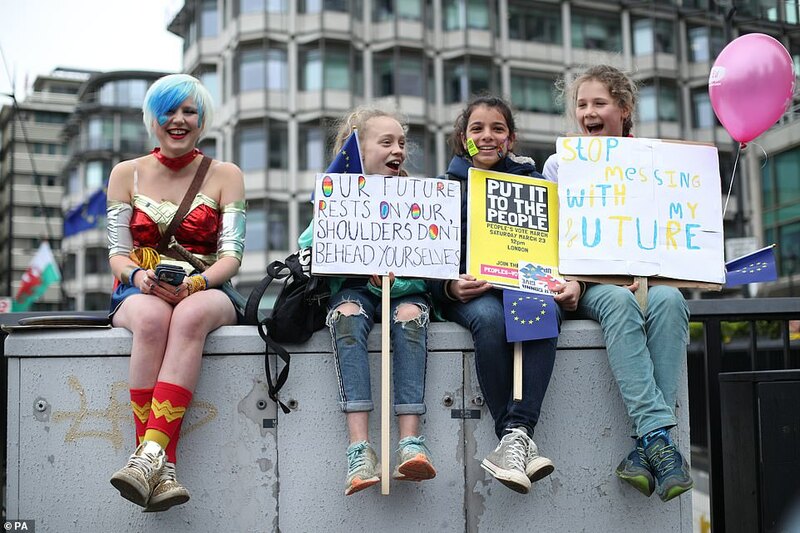 If she succeeds, Britain - which was staring at a cliff-edge deadline of March 29 for leaving the EU - will depart on May 22 under the terms of the withdrawal agreement the prime minister struck with Brussels last year. 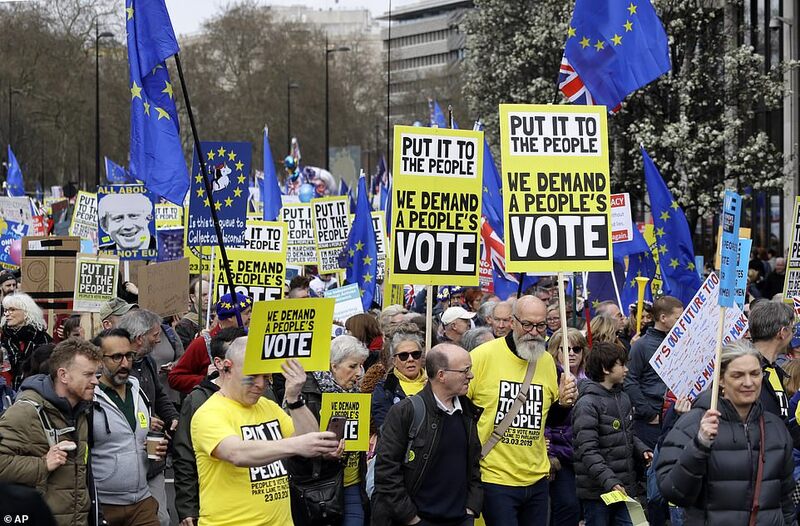 Watson said he had now decided to campaign for a referendum 'reluctantly' and would back May's deal if it was also put to the people. 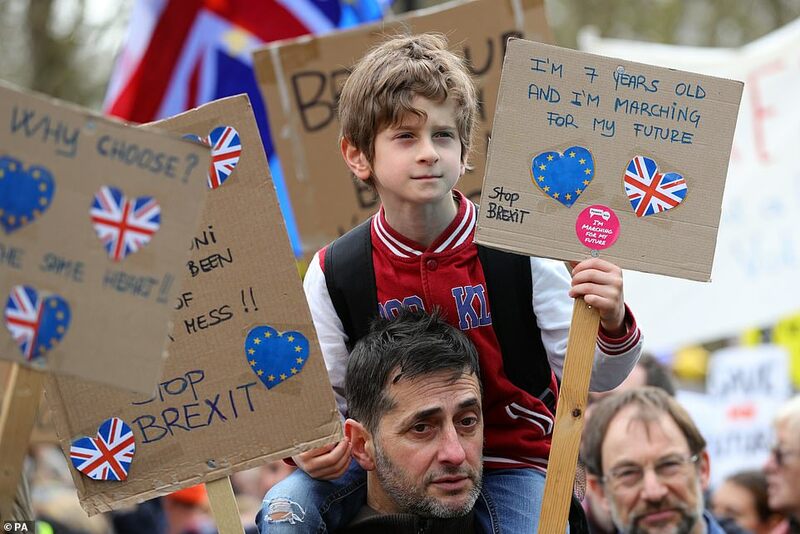 'It can only begin to bring the country back together again if we all have a final say - and then live with the result,' he said. 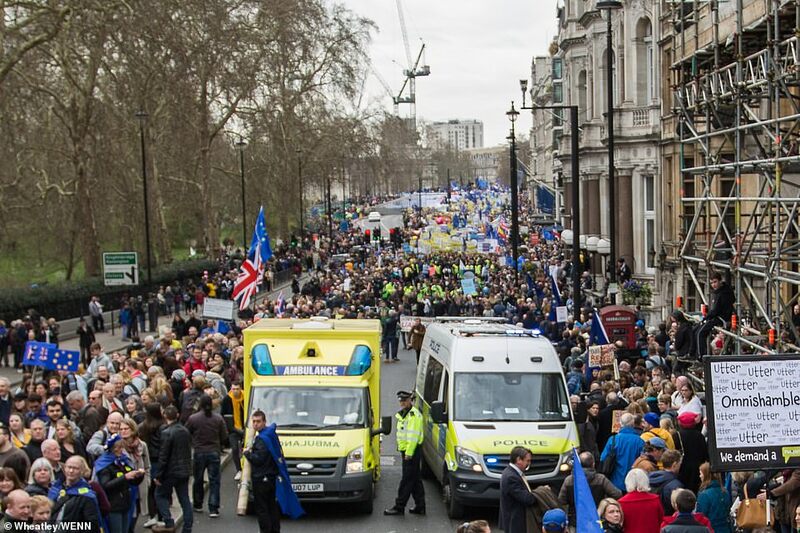 What a turnout in London today. 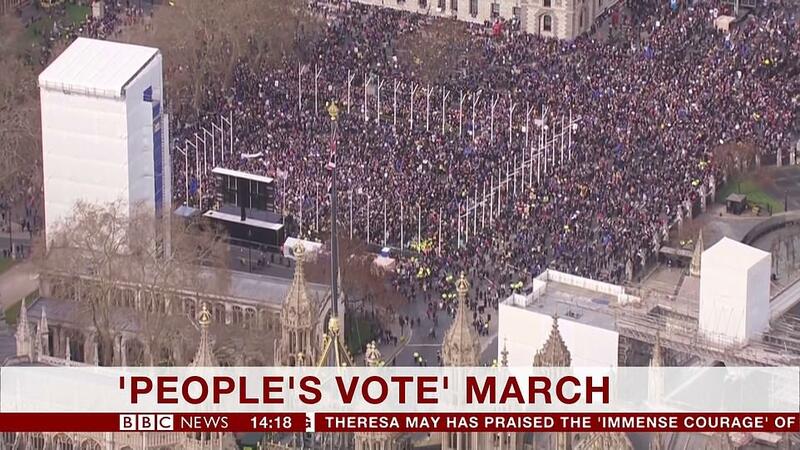 As an outsider I may not understand the Brexit issue fully but I see the validity of having another vote. Only one more vote. 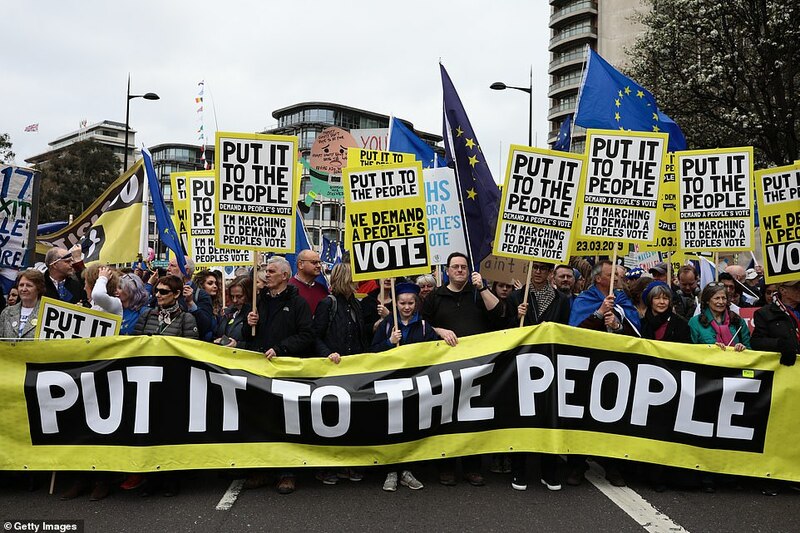 Considering that there was Russian interference and influence prior to the Brexit vote I think it is legitimate to vote a second time. 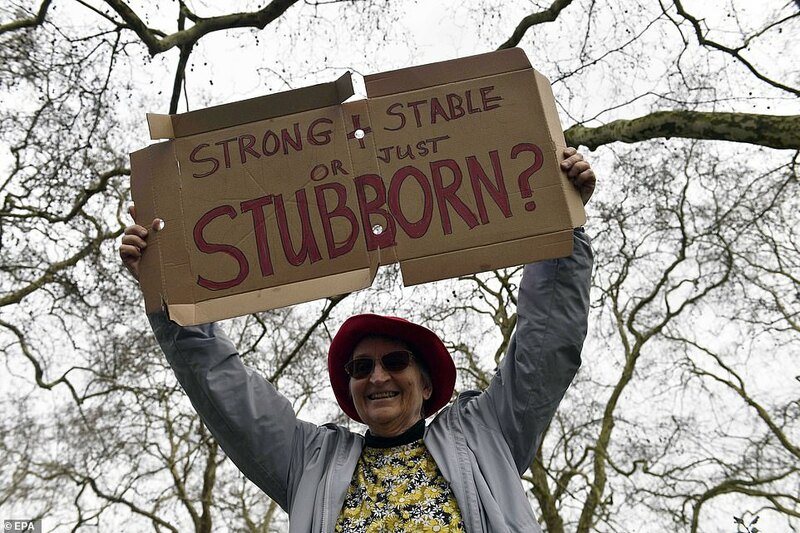 The more I think about how this whole issue came about I have to seriously question David Cameron’s logic. What was he thinking? 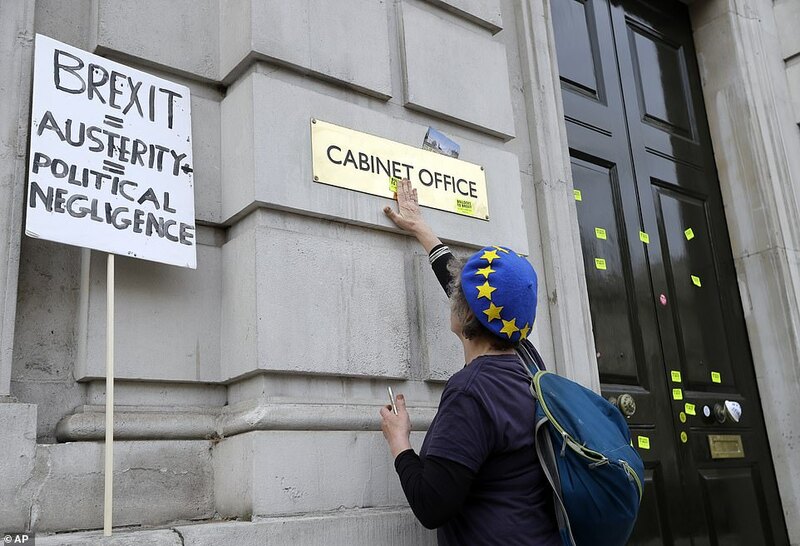 What was the contingency plan if the vote was to leave? 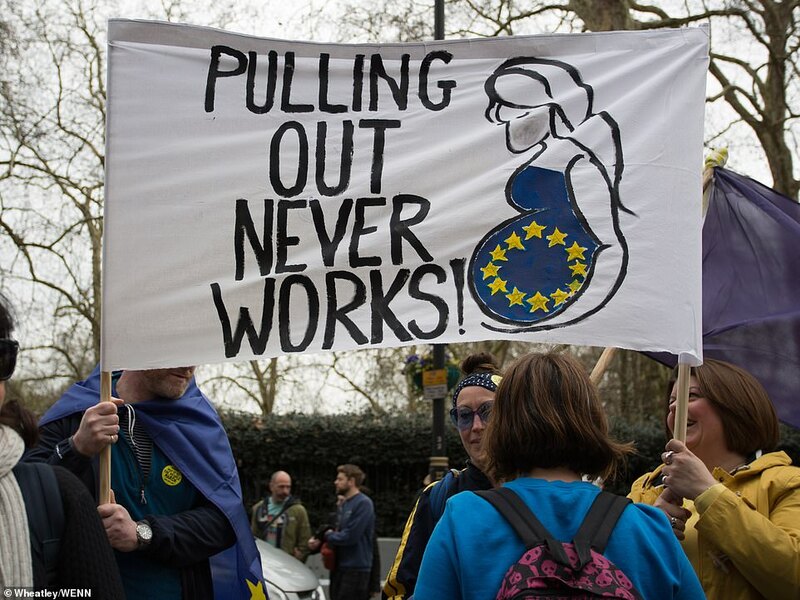 How difficult would it be to work with Parliament to implement a feasible and orderly exit? What might the repercussions be? 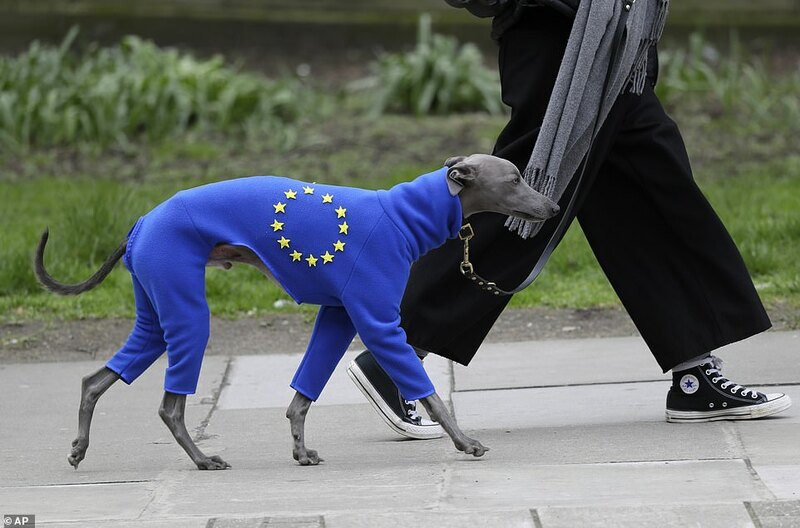 I think the whole thing was shortsighted and put the U.K. in a potentially precarious position on the world stage. And that seems to be what has happened. 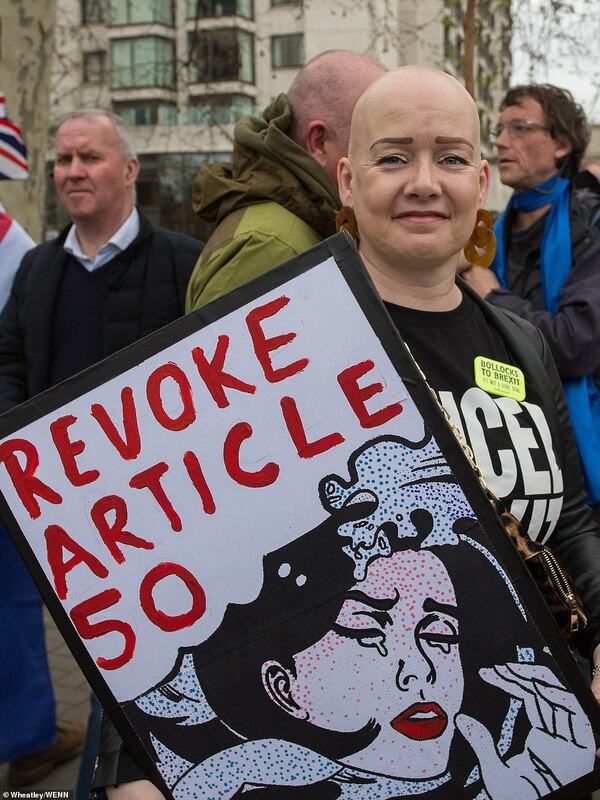 And that’s surely where Russia wanted the U.K. to be. 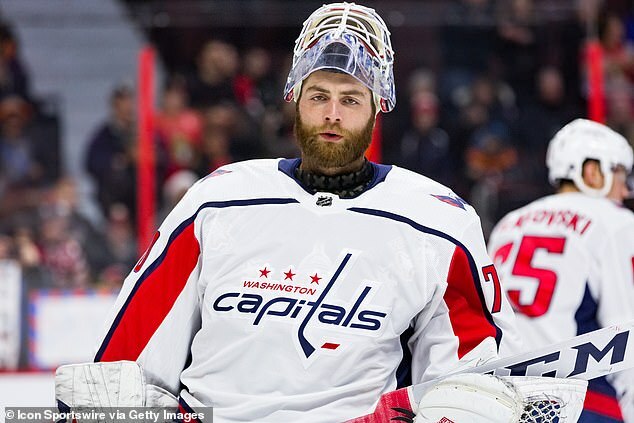 Washington Capitals goaltender Braden Holtby has become the latest major North American sports star to reject an invitation to the Trump White House. The reigning Stanley Cup champions will have a private gathering at the White House on Monday, which is a departure from other title-winning teams that met with President Donald Trump and his predecessors in front of the media. 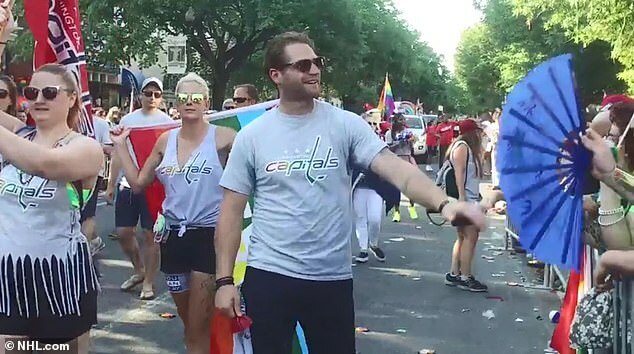 Holtby was asked Friday if his support of the LGBTQ community factored into his decision to 'respectfully decline' the offer, as he put it. 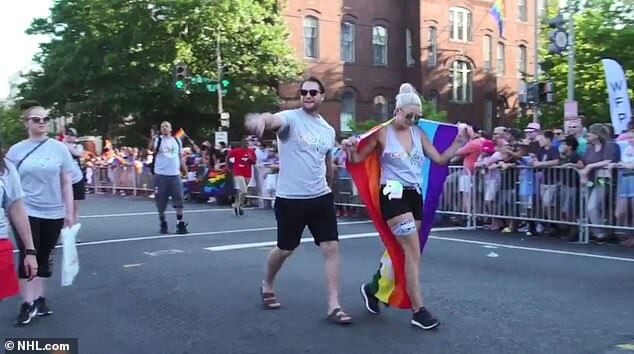 The 29-year Saskatchewan native has marched in several pride parades in the Washington area. Trump drew criticism from human rights groups after banning transgender people from the military in 2017. 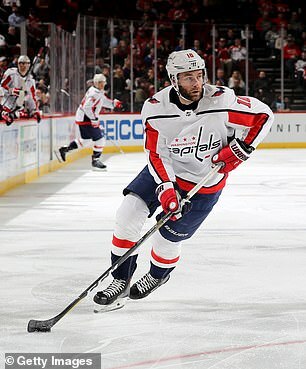 Speaking after Capitals practice, Holtby explained that it was not an easy choice to make – particularly because he did not want to disappoint his teammates. 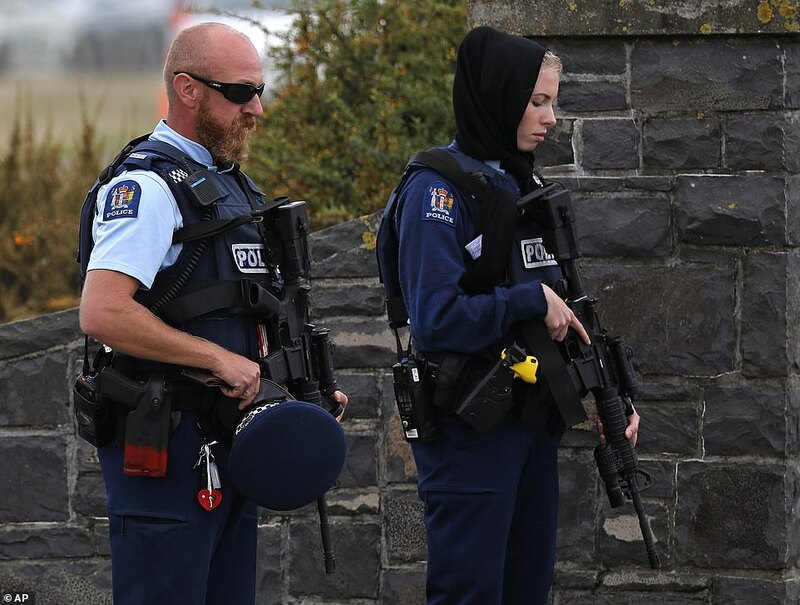 'It's a tough situation for everyone, to be forced into making a decision,' he said. 'You're a team. You want to stick together, no matter what. I hope everyone kind of blows it away. That you don't worry about who goes and who doesn't. 'For me, it's just a personal thing. I believe in what I believe in. In order to stick to those values, I have to do what I think is right, but that doesn't make a difference in anyone else's decision. We stick by every teammate and their decision. 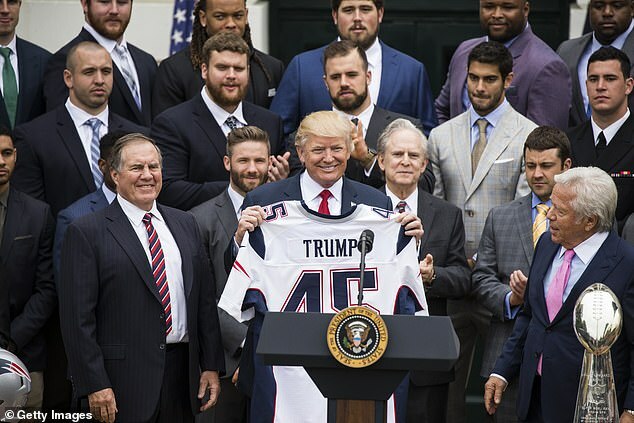 Recent champions like the Golden State Warriors and the Philadelphia Eagles have balked at the customary visit to the White House, or were disinvited, depending on one's perspective. Several players on the Warriors said they would not go to the White House after winning the NBA title in 2017, so Trump rescinded the invitation for the entire team. The White House also canceled a planned visit for the Philadelphia Eagles last June; and during the 2018 NBA Finals, Trump pre-emptively disinvited by the Warriors and the Cleveland Cavaliers, but only after LeBron James declared publicly that nobody from either team would be visiting 1600 Pennsylvania Avenue. Holtby cited those team's decisions while explaining his on Friday. Holtby won't be the only players skipping the White House visit. Forwards Brett Connolly and Devante Smith-Pelly both declined. 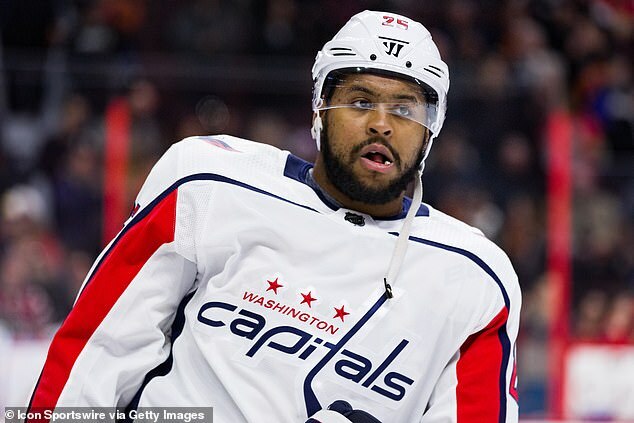 Smith-Pelly told Canada's Postmedia during the Stanley Cup Finals that his decision would be made primarily based on past comments from President Donald Trump. Connolly cited Smith-Pelly, who was waived in February, in his explanation. One player who is expected to attend is team captain Alexander Ovechkin, the Russian legend who currently leads the NHL with 48 goals on the season. 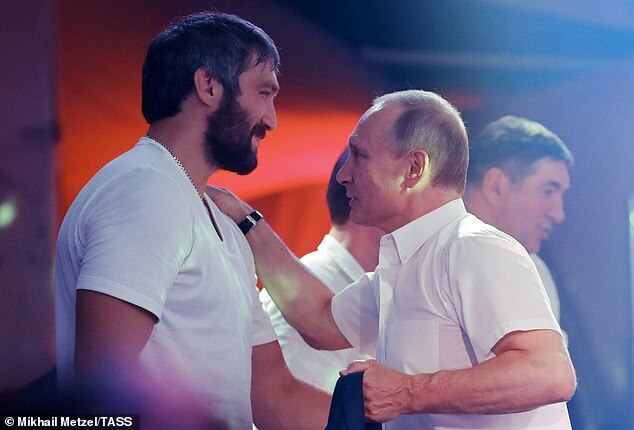 While some players have refrained from being political, Ovechkin is a staunch supporter of Russian President Vladimir Putin, who, according to U.S. agencies, ordered interference into the 2016 election with the aim of hurting Trump's opponent, Hillary Clinton. The NHL veteran went so far as announce the start of a social movement he called 'PutinTeam' in 2017. Following the Capitals' Stanley Cup win over Las Vegas last June, Trump called out Ovechkin in a tweet for his spectacular postseason (15 goals and 12 assists in 25 games). Ovechkin, who won the Conn Smythe Trophy as the MVP of the 2018 NHL postseason, has said his praise of Putin is somehow non-political, stressing that he hopes for better relations between the two countries - a desire Trump has expressed publicly as well. Holtby is not the first NHL goalie to decline an invitation to the White House . Former Boston Bruins netminder Tim Thomas refused the invite from Barack Obama's White House in 2012. 'I believe the Federal government has grown out of control, threatening the Rights, Liberties, and Property of the People,' read the statement from Thomas, who is now out of the NHL. The Muslim-American Gold Star father who denounced then-candidate Donald Trump at the Democratic National Convention in 2016 criticized the president for attacking John McCain while praising Vladimir Putin and Kim Jong-un. 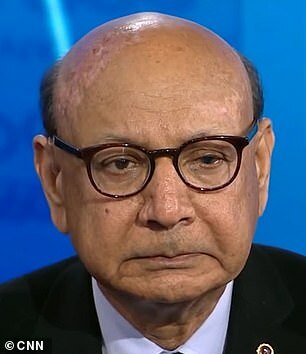 Khizr Khan is the Pakistani-American whose son Humayun Khan, a captain in the United States Army, was killed while serving in Iraq in 2004. ‘He has good words to say about Putin, our adversary,’ Khan told CNN on Thursday. 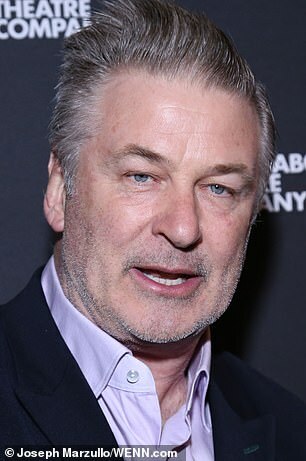 ‘He has good words to say about Kim Jong-un, yet he disrespects our hero, he disrespects Senator McCain and his family. 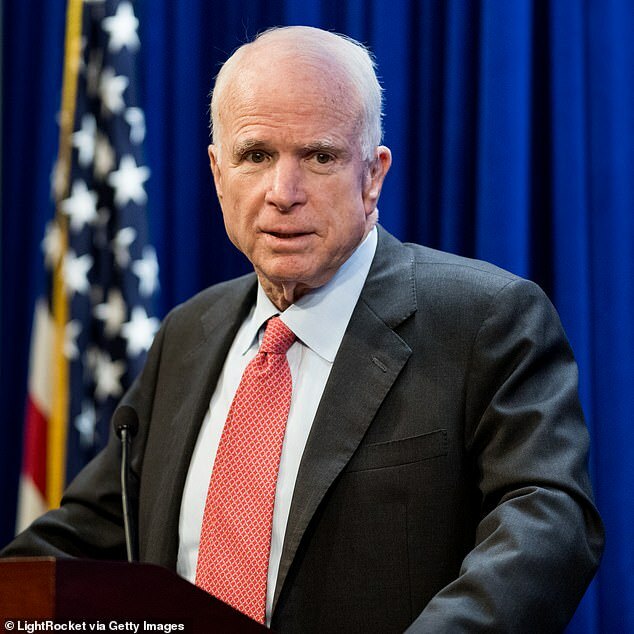 The bereaved father said that he had known McCain, the late senator from Arizona, for years. 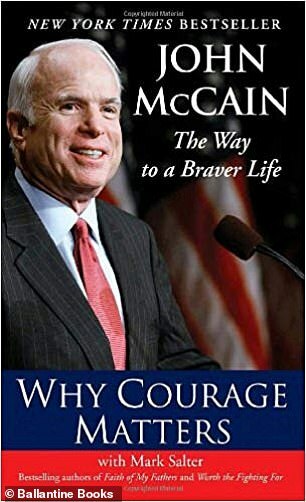 Khan told CNN on Thursday that the last book his son read before he was killed in Iraq was McCain’s Why Courage Matters: The Way To A Braver Life. 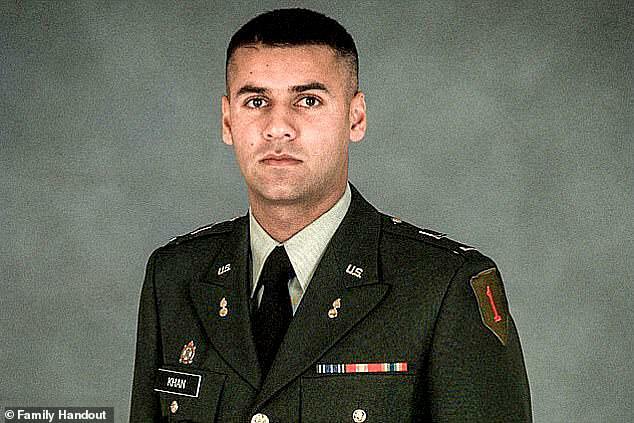 While serving his country in Iraq in 2004, at the age of 27, Humayun Khan was killed as he ran towards a suicide bomber who had burst into his base in a taxi - and probably saved the lives of hundreds of soldiers. After Humayun Khan told his father that he and the other soldiers in his camp were reading the book, Khizr Khan said that McCain agreed to personally sign the book and inscribe a message to dozens of cadets who were serving alongside his son. In the ensuing years, Khan and McCain would meet so that the senator could sign and inscribe books for newly enlisted cadets. 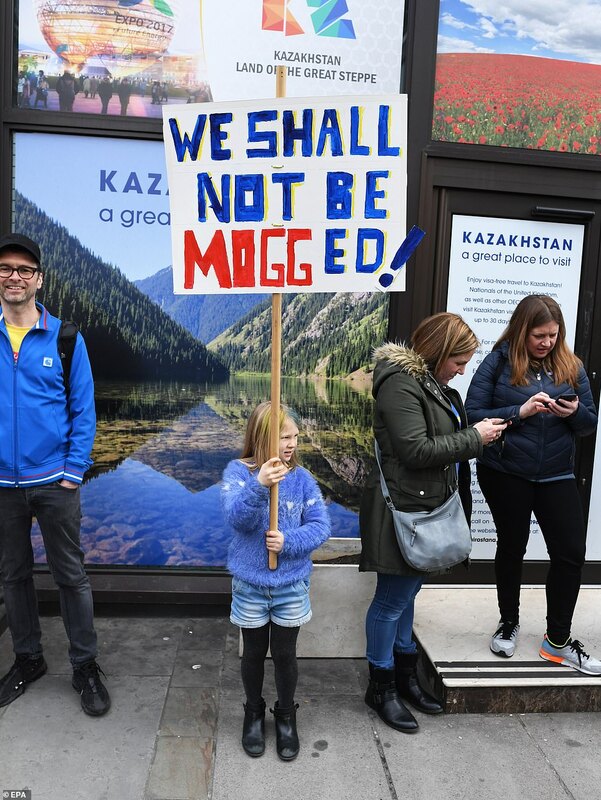 ‘At least somebody should pick up that book and in easy English read it to him, maybe he will learn,’ Khan said. Trump has repeatedly criticized McCain in recent days, once again sparking outrage given that the late senator died from brain cancer last summer. The president told a crowd gathered for a rally in Ohio this week that the McCain family did not thank him for approving the funeral arrangements. The comments prompted McCain’s daughter, The View co-host Meghan McCain, to defend her father. Meghan McCain said on Thursday that the president’s comments reminded her of Trump’s criticisms of the Khans from 2016. Khan also slammed Trump for continuing his attacks on McCain even though he is not alive to respond. ‘Senator McCain had passed seven months ago,’ Khan said. ‘There is [a] limit. There is height of this clownishness. 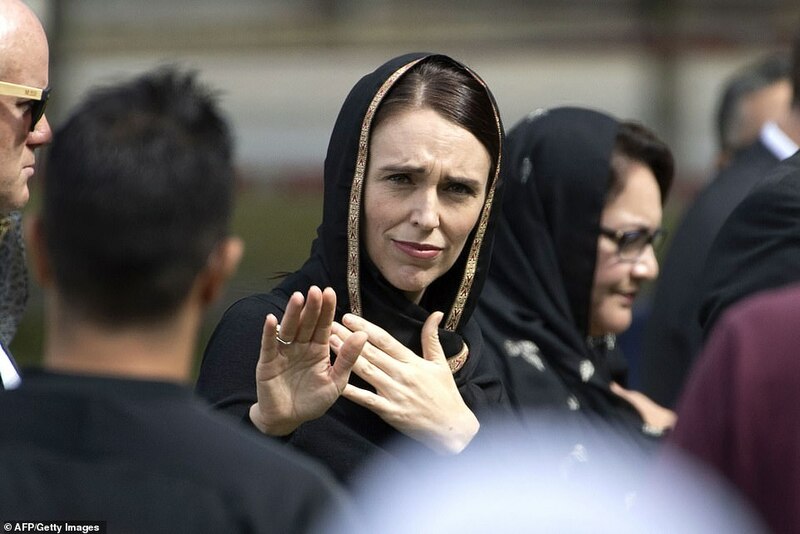 'He's exactly saying what he was before the election, before he became [a] candidate, how he has lived his life and this is a moment to pause for those who support him,' Khan said. 'He showed them something that is not there,' he said. Khan is a former Republican who switched allegiance to the Democrats after Trump proposed banning Muslims during the campaign and escalated his rhetoric against illegal immigrants. 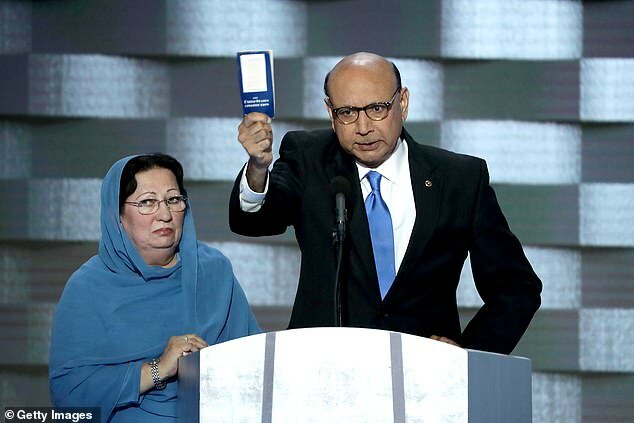 He appeared with his wife, Ghazala Khan, at the Democratic Convention in Philadelphia and held a copy of the Constitution while slamming Trump. Trump criticized Khan and his wife, wondering aloud why she stood there silently while her husband spoke. The remarks by Trump sparked outrage, and prompted McCain to come to the Khans’ defense. 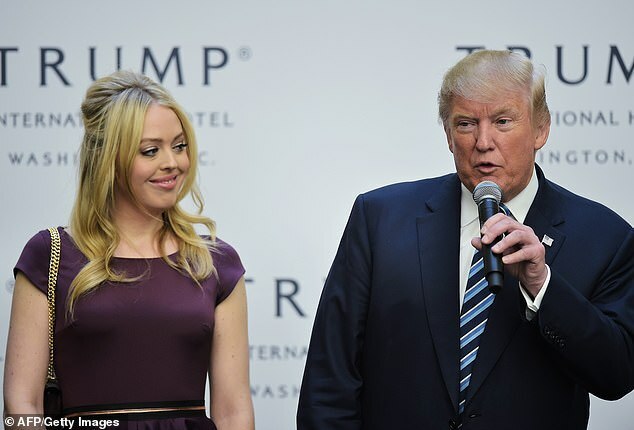 Trump attacked John McCain yet again on Thursday, calling him 'horrible' after the late senator's two daughters begged earlier that day for the president to leave their dad and family alone. Mueller found no collusion . Yep there are crimes that were committed but Barr claims not enough evidence to prosecute. Mueller should have at the very least have been found for obstruction of justice. Leaving it to the discretion of Barr is a big mistake! The House of Representatives needs to call both Barr and Mueller himself to testify to the Judiciary Committee. 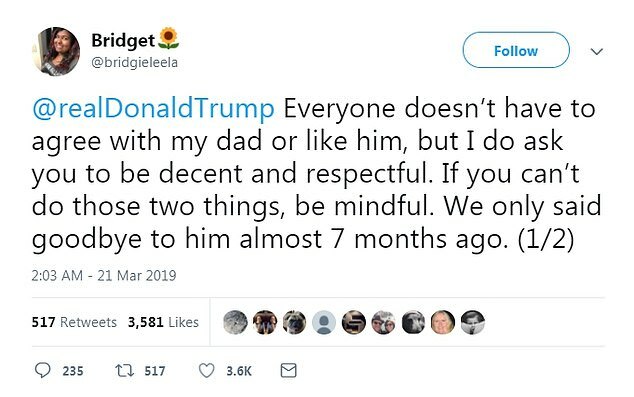 One thing I think a lot of people are missing is that if drumpf is impeached Pence becomes President and he's just as dangerous as drumpf - maybe more. Not only is he ultra-conservative, he's smart and politically savvy. If Congress can keep the worst of drumpf's policies under control, it might be better to wait out his term and let the SDNY prosecute him as soon as he's no longer a sitting president. There have been quite a few political experts who have said that it will be the Southern District of NY who will be Trump’s undoing. I think impeachment is very unlikely now. With the lack of a conspiracy charge I don’t think any Republicans would vote for impeachment. The House of Representatives should carry out all of their investigations. The public needs to know the extent of Trump’s corruption. Hopefully at some point Trump will clearly be held to account for all his wrongdoings. 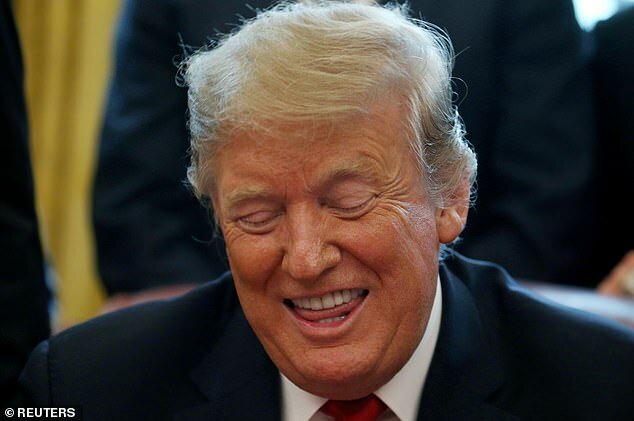 What's in the SDNY's favor is that they're not part of the federal system, so they don't have to worry about drumpf being protected from prosecution. He can't hide behind the presidency to avoid the SDNY's charges. If if turns out that they can't put him behind bars, they can at least put a major financial dent in his "empire". I think I'd almost rather see him totally broke than in jail - almost. 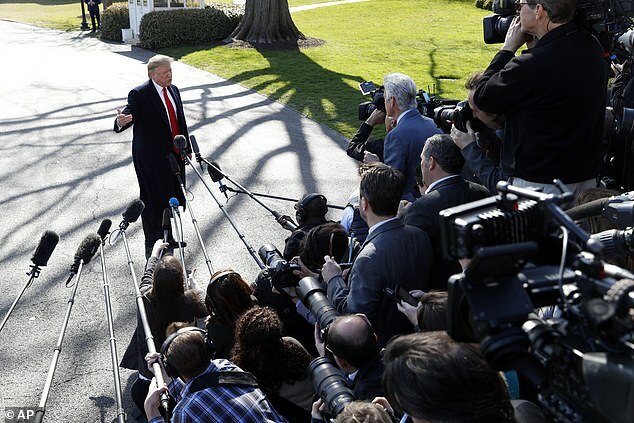 President Donald Trump's reelection campaign is taking its fight against Russia'collusion' critics to the airwaves, pushing TV producers not to host prominent Democrats who talked up conspiracy charges that didn't pan out. 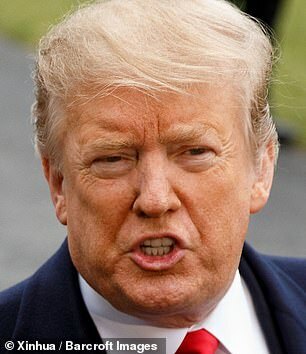 The effort, revealed in a memo by Trump's campaign communications director, urged by TV producers to keep in mind guests who he claims made 'outlandish' and 'false claims,' and cites Attorney General Bill Barr's summary of Special Counsel Robert Mueller's findings. 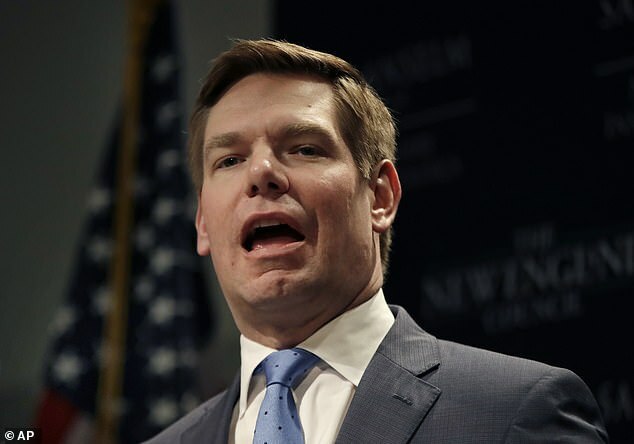 Communications Director Tim Murtaugh's letter singles out two powerful committee chairs – Reps. Jerold Nadler and Adam Schiff – as well as Rep. Eric Swalwell of the House Intelligence Committee and Democratic National Committee Chairman Tom Perez and Sen. Richard Blumenthal of Connecticut. It also lists former CIA Director John Brennan, a favorite target of President Trump's. 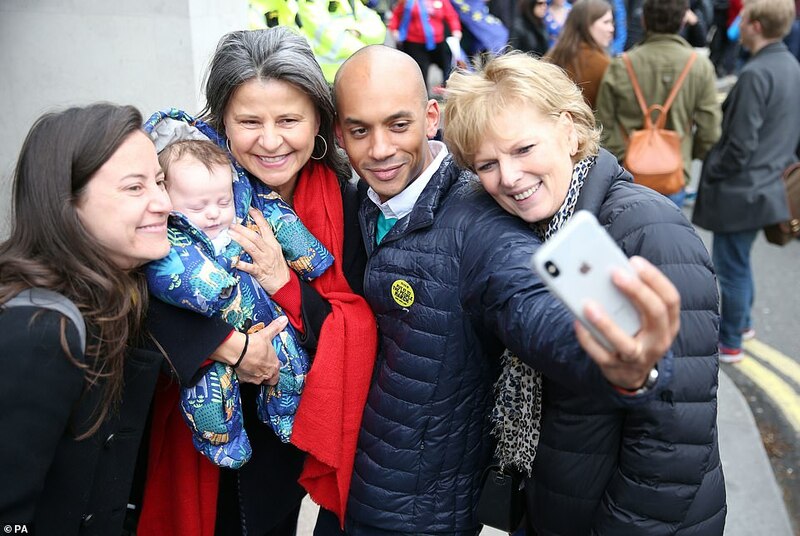 All are a staple of TV bookers and are unlikely to be blacklisted by the campaign's request. Nevertheless, the Trump camp compiled statements from each that says the guests should be asked about if and when they appear. The memo was reported by Axios. Barr's letter summarizing the Mueller report's findings states: 'The Special Counsel did not find that the Trump campaign, or anyone associated with it, conspired or coordinated with the Russian government in these efforts, despite multiple offers from Russian-affiliated individuals to assist the Trump campaign,' Barr wrote. Notably, the citation refers to the 'Russian government' – terminology that might not include WikiLeaks or other non-governmental Russians, possibly even including the Kremlin-linked lawyer who met with top Trump officials in Trump Tower. It also cites 'multiple offers' from the Russian-affiliated people to help the Trump camp. 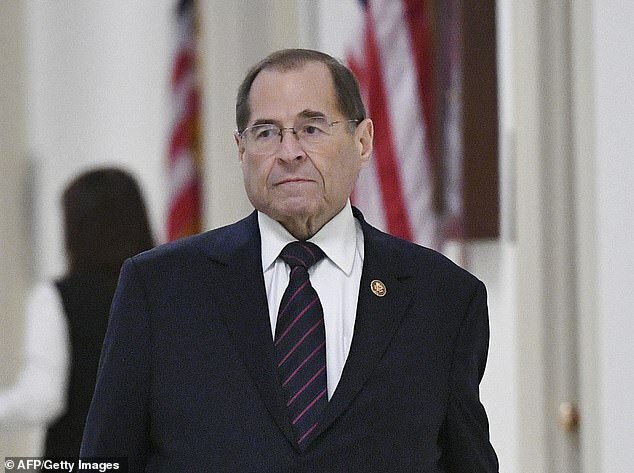 Nadler, who like Schiff is conducting his own probe, did not signal an intent to back down, and is demanding Barr testify and release the full Mueller report to Congress. 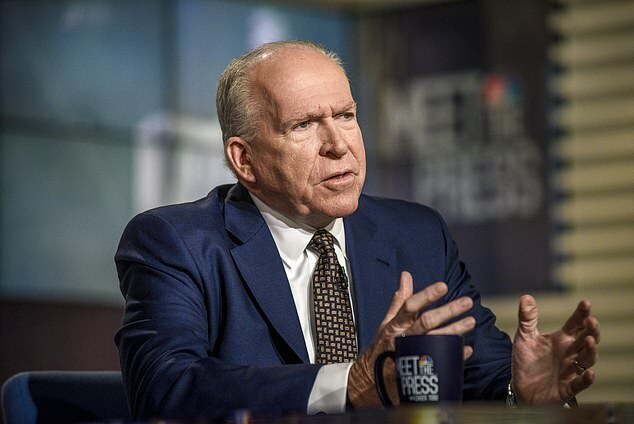 Brennan cast off his normally tight-lipped persona to become one of President Trump's fiercest critics after he ended his tenure. During media appearances, Brennan predicted the Mueller probe could ensnare Trump family members. He also predicted incorrectly, that Mueller would bring additional indictments dealing with criminal conspiracy. An in one startling comment, he declared Trump's press conference in Helsinki with Russian President Vladimir Putin was 'nothing short of treasonous.' Trump did not challenge Putin's denial of election interference at the event. Barr's letter describes the Russian interference in the election as an established fact. The Trump release quotes Brennan as standing by his treason statement. Rudy Giuliani has blasted CNN in a heated interview where he squared off with host Chris Cuomo saying 'this network should apologize'. Donald Trump's lawyer slammed the network on Monday evening for their 'torturous' coverage of the Mueller investigation, despite its anti-climactic results that failed to prove the president colluded with Russia in the 2016 presidential campaign. 'You guys on this network have tortured this man for two years with collusion and nobody’s apologizing. Before we talk about obstruction, apologize,' Giuliani demanded pointing fingers to the camera and hitting the desk with fervor. Cuomo refused to apologize for CNN's coverage of the Special Counsel's two-year investigation saying 'not a chance'. Still Giuliani huffed that the New York Times, the Washington Post and House Intelligence Committee Chairman Adam Schiff should all apologize for their coverage and treatment of the president in the investigation. 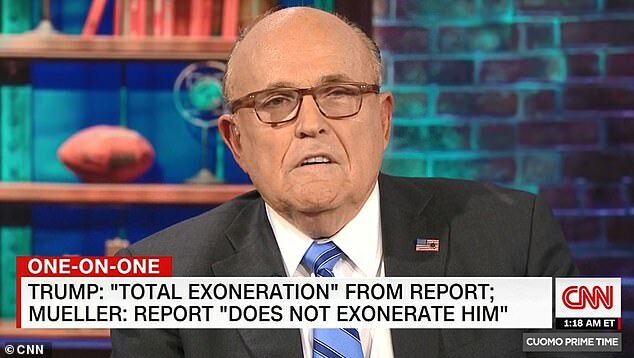 Giuliani went on to slam the report for failing to exonerate the president, even though he wasn't found guilty of collusion. 'This is a cheap shot. This is unprofessional,' the 74-year-old lawyer said. 'They don’t have to exonerate him, you gotta prove he’s guilty. Even for impeachment...[Trump] is exonerated in the next two paragraphs,' Giuliani argued pointing to the report. 'The next two paragraphs say 'not sufficient evidence' and 'no obstructive conduct...That's exoneration by Rod Rosenstein, the attorney general and the Office of Legal Counsel,' he added. 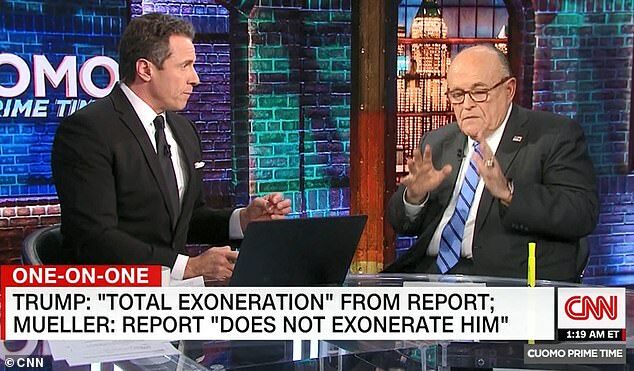 Following the Mueller report, Giuliani has been demanding apologies from media networks and politicians alike for dragging Trump's name. 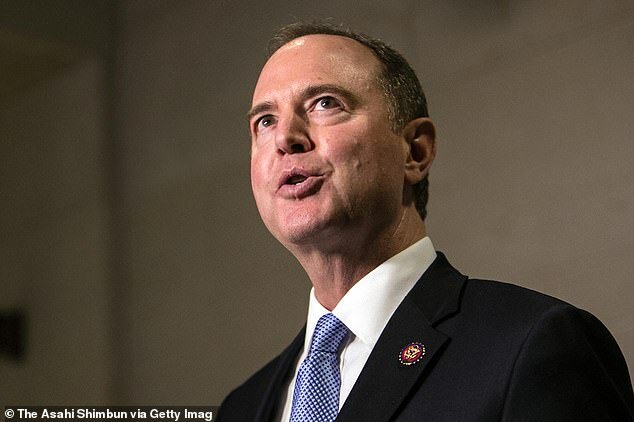 'In light of the Mueller conclusion of no collusion between Trump campaign and Russians are @Adam Schiff, Brennan, Nadler and other Dems going to apologize for their now false claims of collusion. If they care about our country, they should be relieved they were wrong. Are they?' he tweeted Saturday. 'TURNING POINT for our country. If Democrats who went too far in their partisan and false claims of collusion can step back and admit their mistakes, we can heal. If CNN, NBC, MSNBC et al can realize their overreactions, then we have hope for fairer treatment in the future,' he added. As a result of the investigation that found no conclusion about whether Trump obstructed justice, Attorney General William Barr told Congress on Sunday that there was insufficient evidence to pursue the matter any further. '(T)he investigation did not establish that members of the Trump campaign conspired or coordinated with the Russian government in its election interference activities,' Barr said, quoting the report. 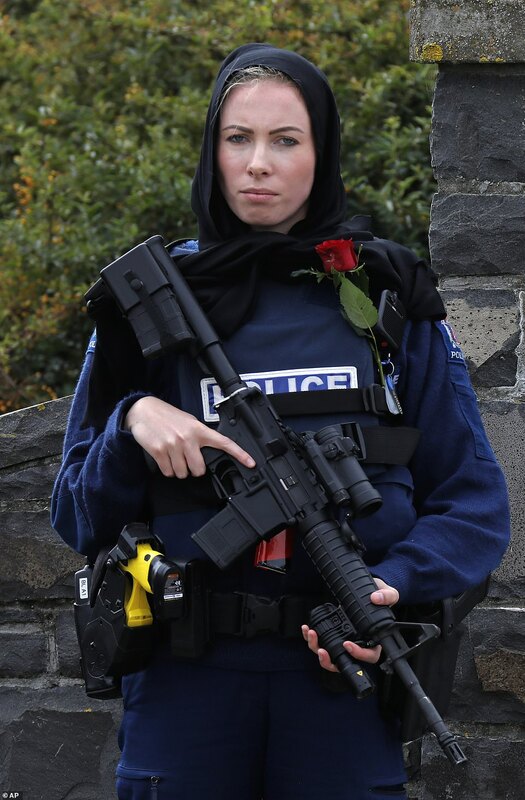 If this thing gets re-elected I'm moving to Canada! 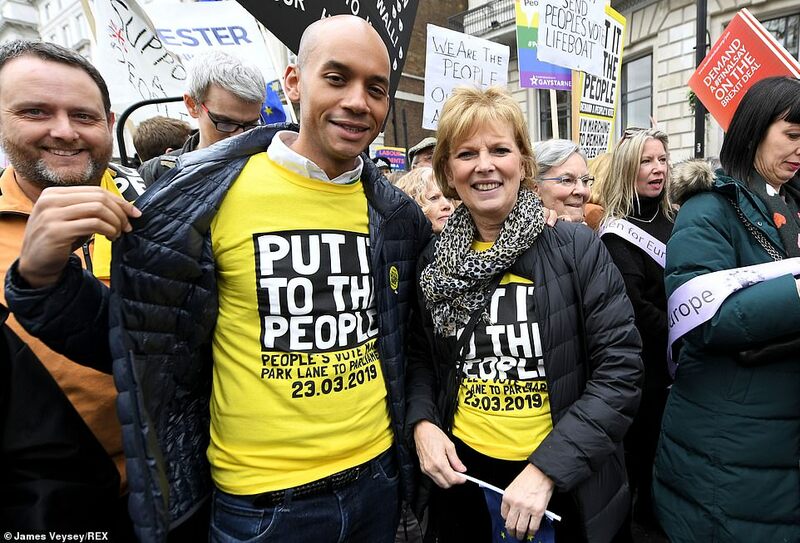 Sadly, Lizzy it's possible he will be elected again . I hope the dems come up with someone who can beat him but looking at the candidates so far I have my doubts. I guess we can hope enough people are sick of him and will want him out.Just the idea the press should apologize to the idiot. When has he ever apologized for any of the nasty things he has said. Keep an eye on Pete Buttigieg. 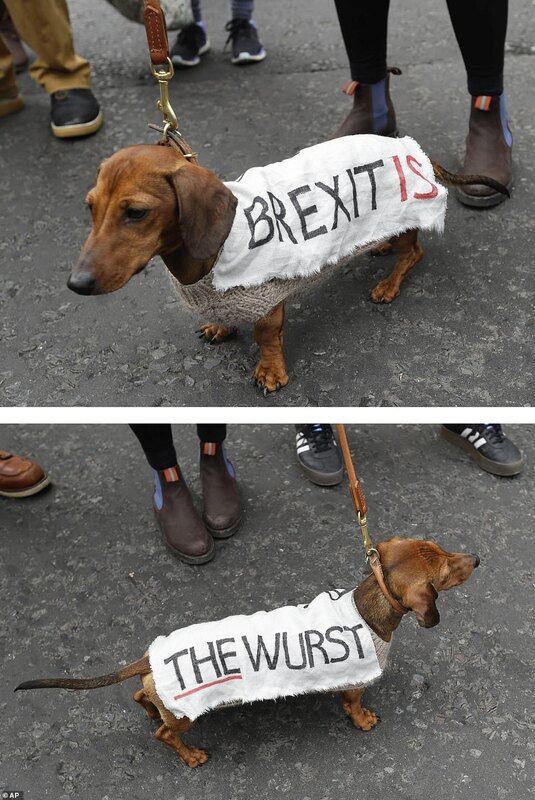 There are others I like, but he's the best I've seen so far. Buttigieg is good. He is so smart, appealing and knows the issues. I’m not sure how he would handle Trump. Need to see all the candidates during the debates to see how they could measure up. I’ve seriously thought of moving to Canada. Tho it wouldn’t be practical I would consider it. I don’t know how I could endure another four years. He and the Trump party will pretty much destroy our democracy if he gets re-elected. He also gets to avoid any criminal prosecutions if he stays in office. Trump has a lot on the line. As time passes I get more cynical about our country. I was heartened though by the 2018 elections. The Democrats won convincingly. 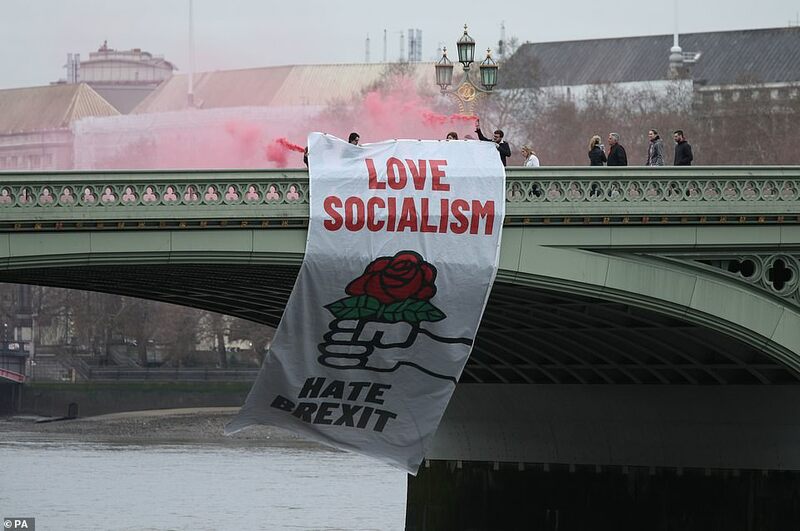 They had momentum and the issues on their side. We have to have that kind of mo going into 2020. Keep harping on the issues. And we do need someone who can stand up to Trump using the TRUTH as their weapon. I have to remember that he won a few states by 20,000 votes or less. If those Dems and Independents who didn’t vote in 2016 because Clinton didn’t inspire them hopefully they will realize how much their vote really counts and will show up at the polls in 2020. 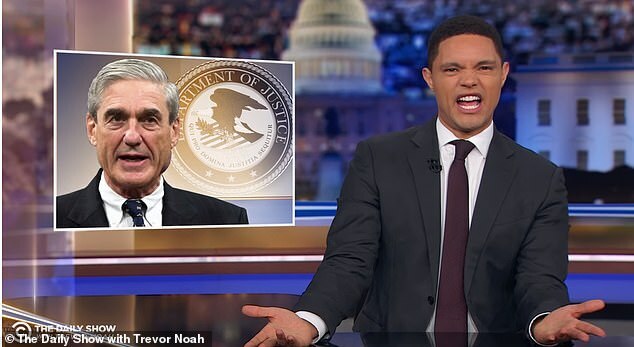 Late-night hosts were forced to apologize to President Trump yesterday after the Mueller report finally cleared him of any Russian collusion. Sadly, for the commander-in-chief however, those apologies were not delivered quite as sincerely he would have hoped. Trevor Noah and Stephen Colbert were among the most prominent comics to 'apologize'. Their sketches came amid a chorus of GOP voices demanding they retract two years' worth of scathing remarks about alleged Russian interference in the 2016 election. 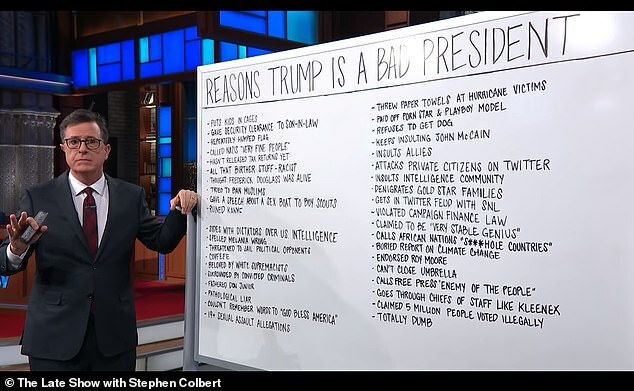 But in their own inimitable way, President Trump still found himself on the receiving end of yet more trademark barbs by the late-night hosts. 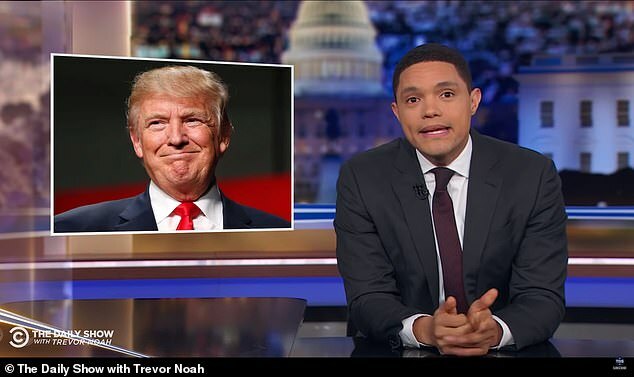 The Daily Show host Noah was one of the first to take the plunge - conceding he needed to apologize to Trump over countless statements mocking the president. Despite the jokes - Noah was still unable to contain his disappointment at the findings. 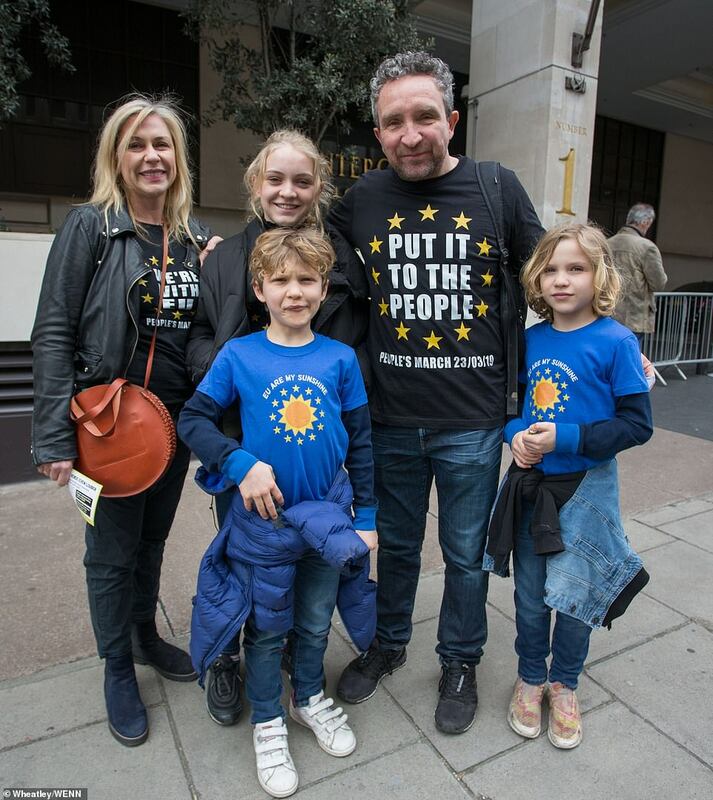 'It's a little bit like coming down the stairs on Christmas morning,' Noah said. 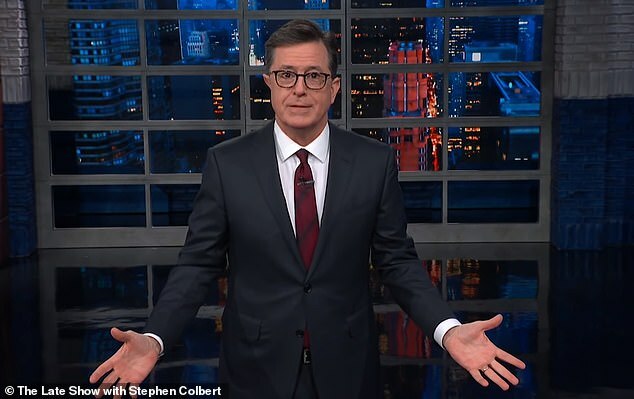 During his CBS show, Colbert delivered a 16-minute monologue on the Mueller report, slamming the findings and again taking aim at the president. 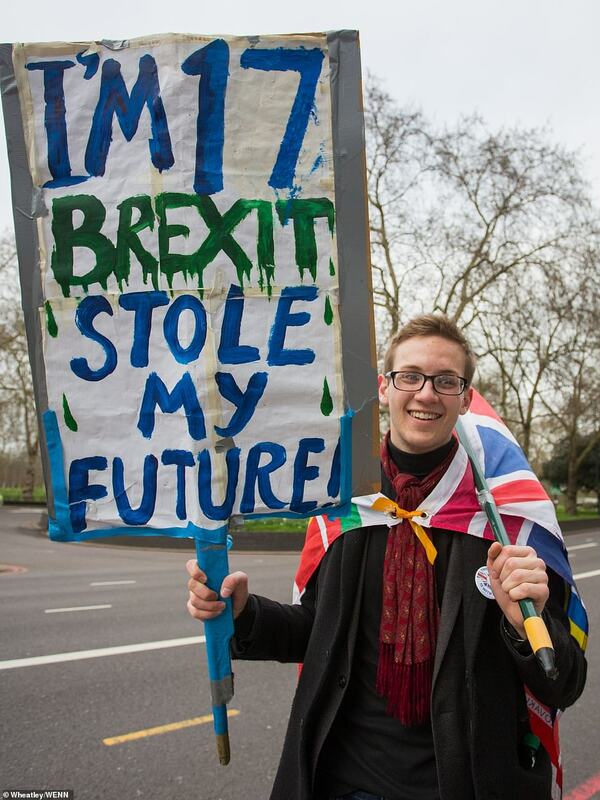 This, he said, was 'troubling' for a number of reasons. 'If Trump is not working with the Russians, then what the hell is wrong with him?' he asked. On ABC, Jimmy Kimmel said the Mueller report didn't bode well for the future of the United States. 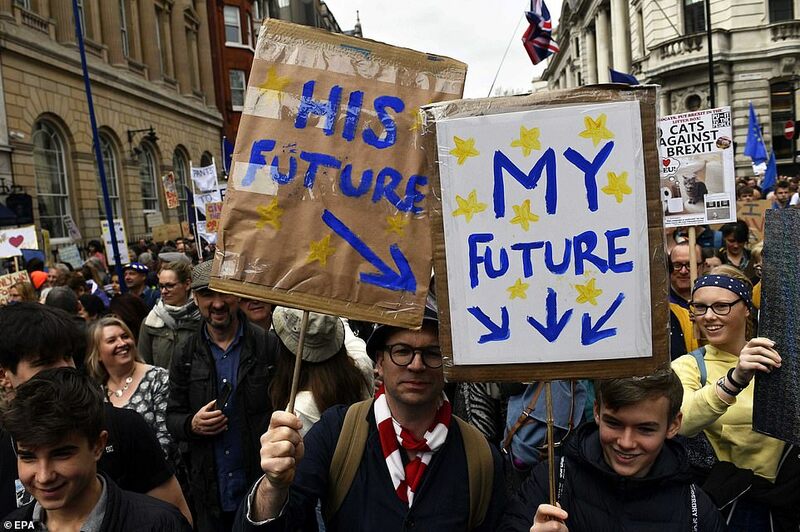 'Now, the process of tearing our country even further apart can finally begin,' he said. 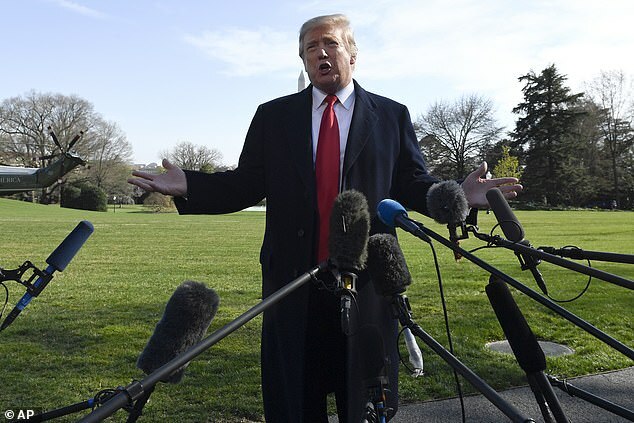 The distinctly unapologetic apologies came amid a backdrop of gleeful howls by GOP members seemingly vindicated by an initial conclusion of the forthcoming Mueller report which clears Trump of serious wrongdoing. Rudolph W. Giuliani, Trump's personal lawyer, also demanded apologies from the late-night comics for their regular barbs against his employer. On Sunday, a four-page summary of the report by the Attorney General, concluded that Trump and his campaign did not collude with Russians in order to improve his chances of beating Democrat Hilary Clinton. 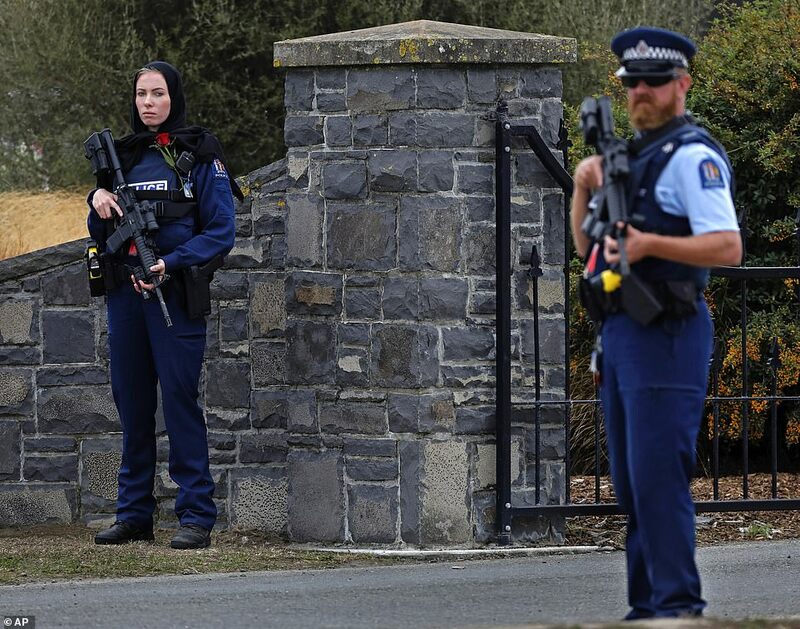 A number of Tinseltown actors and entertainers took to social media to express their shock and frustration just hours after. 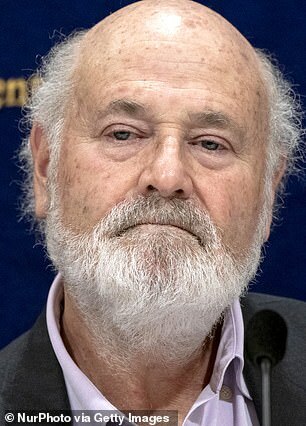 Rob Reiner, the director of Stand By Me and A Few Good Men, tweeted: 'Robert Mueller did not exonerate the President. 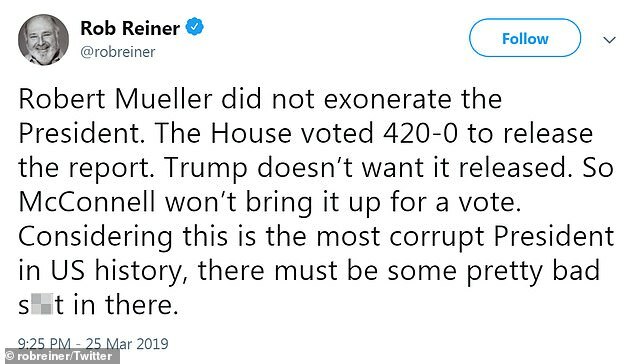 'The House voted 420-0 to release the report. 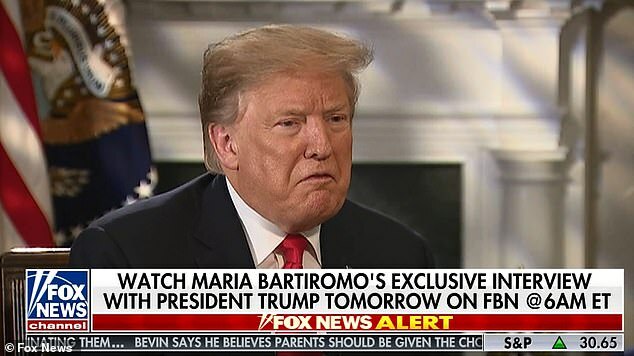 Trump doesn't want it released. So McConnell won't bring it up for a vote. He was so right.This is a joke we all know he did something but it's going to be covered up. 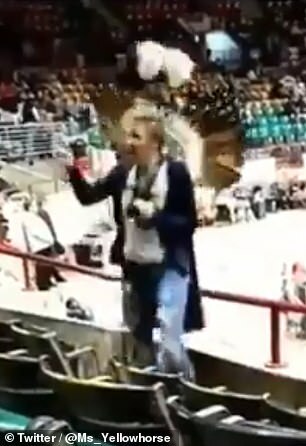 Police kicked a woman out of a Native American powwow after she put on a sacred piece of dancers' regalia and started dancing while wearing it. 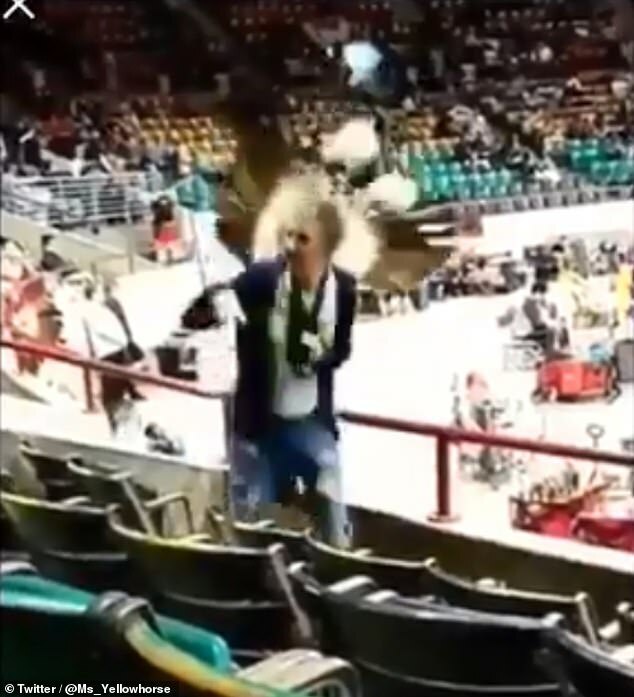 The non-native was seen on video in the stands at the event in Denver on Sunday wearing a Native American's bustle of feathers. 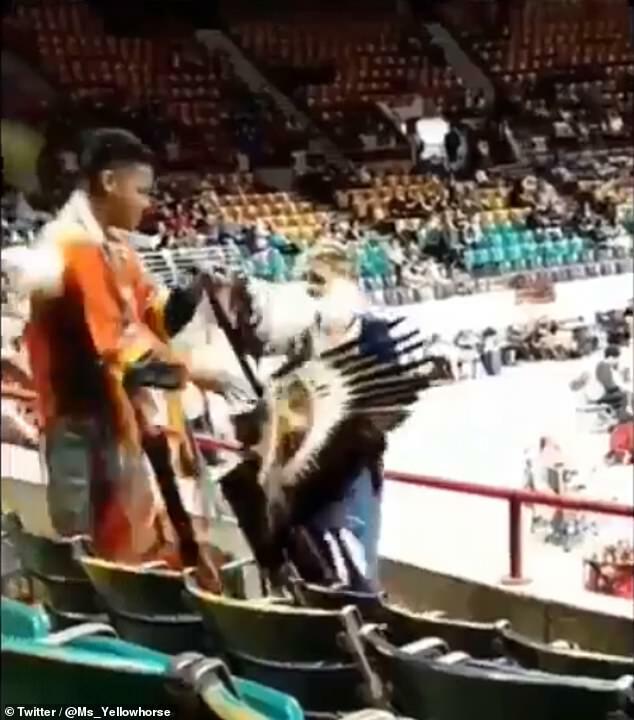 Another Native American who was in attendance at the Denver Coliseum then approaches her, tells her she is being disrespectful and demands that she remove it from her body. 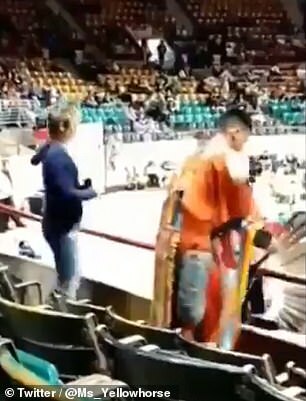 The video of the unidentified woman's dancing was posted online and has been shared thousands of time. 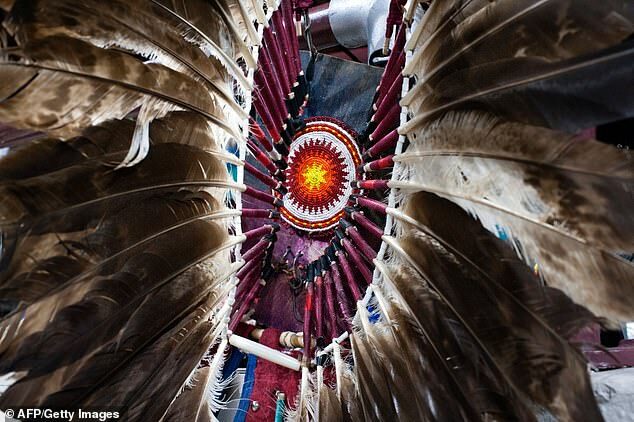 The bustle is a sacred item made with feathers that is a traditional part of regalia worn by Native American dancers. 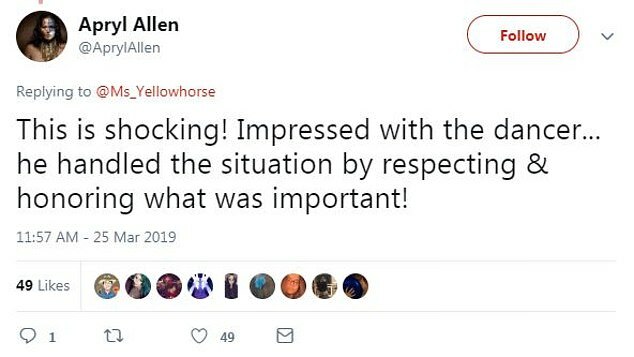 A pharmaceutical chemistry and political science student with the username '@Ms_Yellowhorse' was at the event and shared the video. 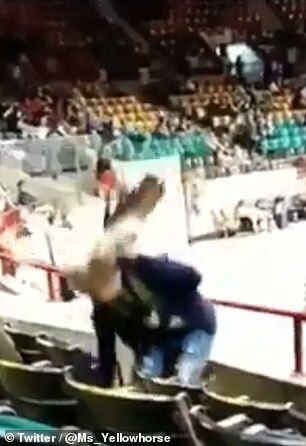 The video shows the woman wearing the regalia on her back and hopping around, bending at the waist at times. As a man named Chad Browneagle eventually comes toward her, she takes off the regalia and extends it toward him. 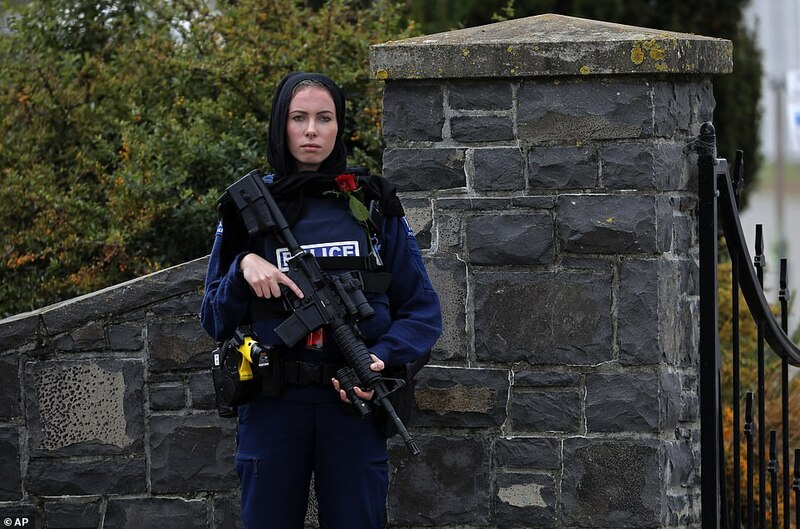 'I noticed she untied somebody’s bustle and had it around her neck, and I was like, "What? Whoa."' Browneagle said. 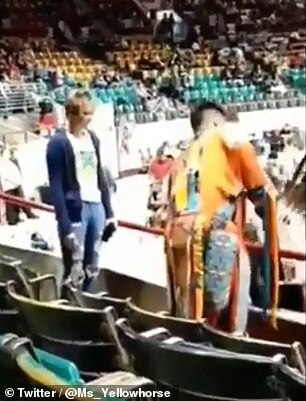 As Browneagle tells the woman to leave things that aren't hers alone, he then takes the bustle and ties it on the railing nearby. 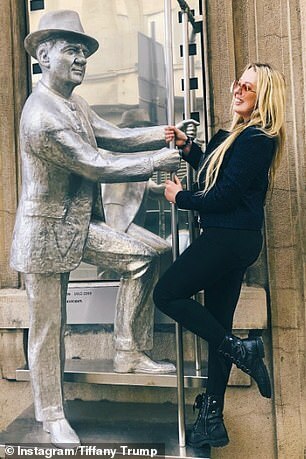 The woman watches for a moment, then awkwardly dances a bit more before returning to standing idly by. 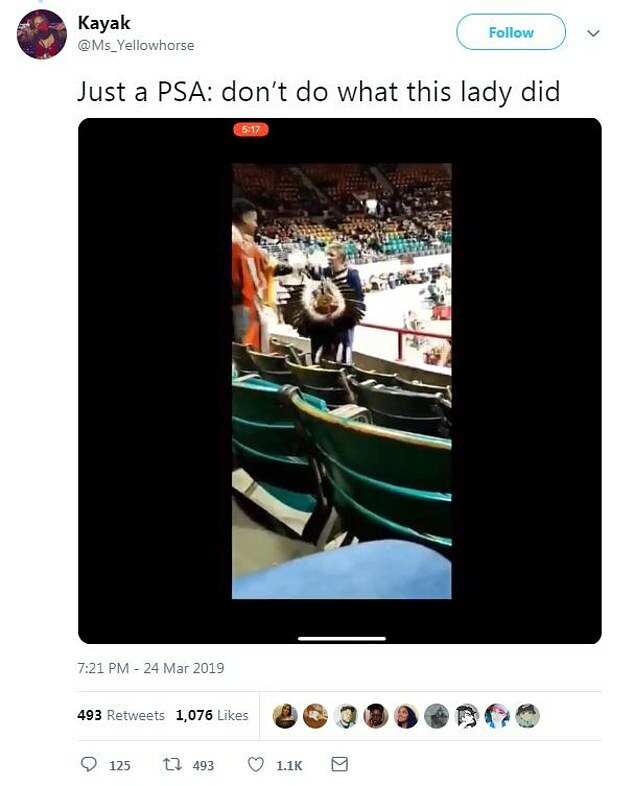 Like many others who were outraged at the seemingly thoughtless behavior of the woman, David Heska Wanbli Weiden, an associate professor of Native American Studies and Political Science at Metropolitan State University of Denver, saw video of the display on Twitter. 'This is an adult. 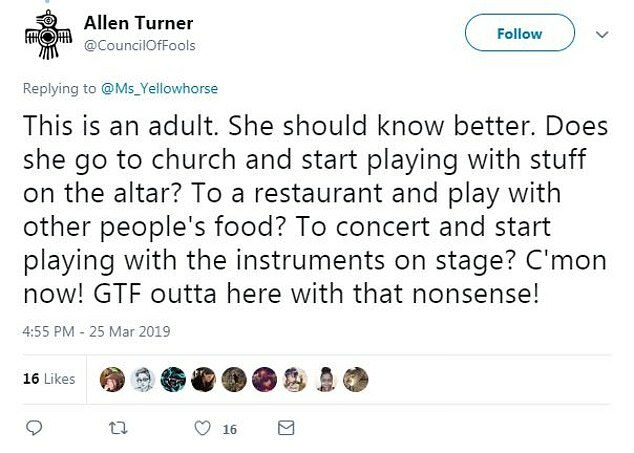 She should know better,' a Twitter user identified as Allen Turner said, in response to user @Ms_Yellohorse's tweet of the video. In contract, the Browneagle's reaction was praised, although he was incorrectly assumed to be the dancer to which the bustle belonged. 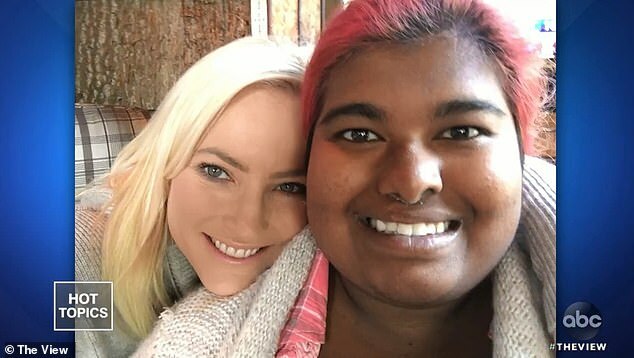 Some users called out the apparent white privilege at play, as the woman in the video appears to be Caucasian. 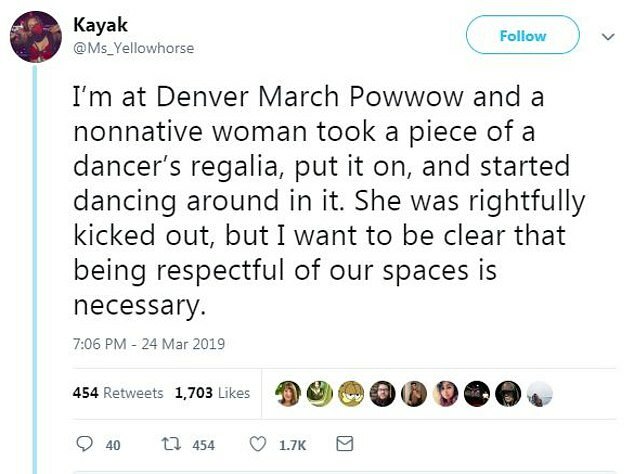 It's not clear why the woman was in attendance at the powwow, but non-native people are apparently welcome at this so long as they respect the space. 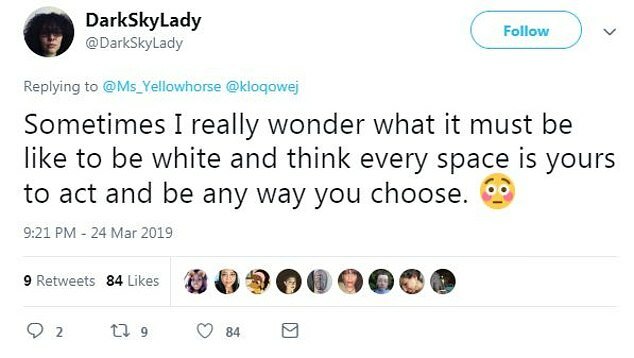 Weiden, who is an enrolled member of the Sicangu Lakota nation, explained appropriate guidelines for those wishing to attend a powwow, which is a sacred event. 'You never take a photograph unless you ask first,' Weiden said. Weiden said a powwow should be treated like any other religious or sacred ceremony. 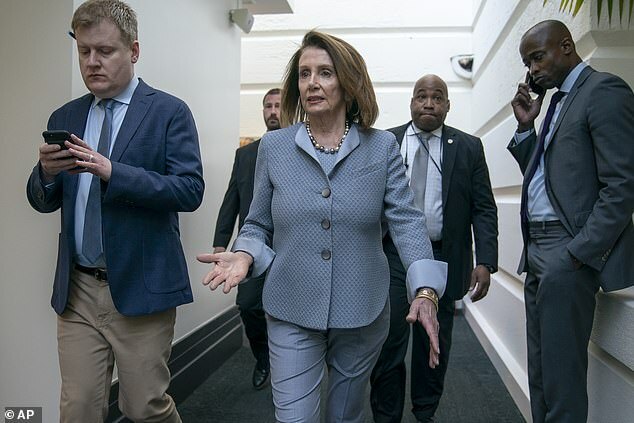 House Democrats failed in their attempt on Tuesday to override President Donald Trump's first veto, which was the president's rebuke of their effort to annul his national emergency declaration at the border. The final vote was 248 yeas to 181 nays. Democrats needed to reach two-thirds of the House chamber to prevail. Fourteen Republicans crossed the aisle to vote to override the president. 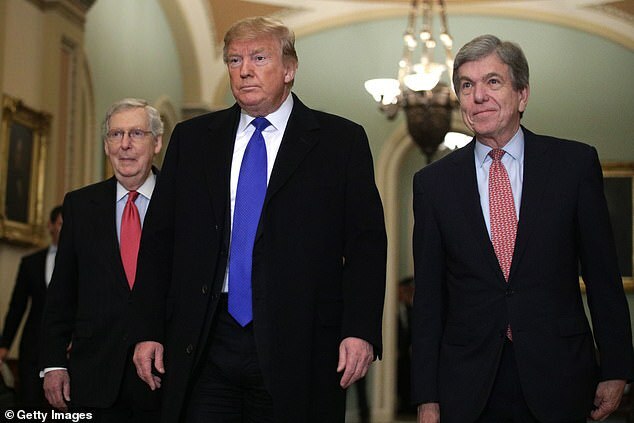 The vote came as Trump was across the Capitol, having lunch with Senate Republicans. It added to the good news the president received this week after the special counsel cleared him and his campaign of colluding with Russia during the 2016 election and his longtime nemesis, attorney Michael Avenatti, was arrested on charges of extortion. The vote also came on the same day as Speaker Nancy Pelosi's 79th birthday. The California Democrat led her party in the fight against the president in her first move as speaker. She kept her Democrats in line and stood firm against the president during the month-long government shutdown over the fight to fund Trump's wall. And she vowed Democrats would continue to work to try and stop the president. 'The President’s lawless emergency declaration clearly violates the Congress’s exclusive power of the purse, and Congress will work through the appropriations and defense authorization processes to terminate this dangerous action and restore our constitutional system of balance of powers,' she said in a statement after the vote. The failed vote was the accumulation of a long battle over the president's border wall. 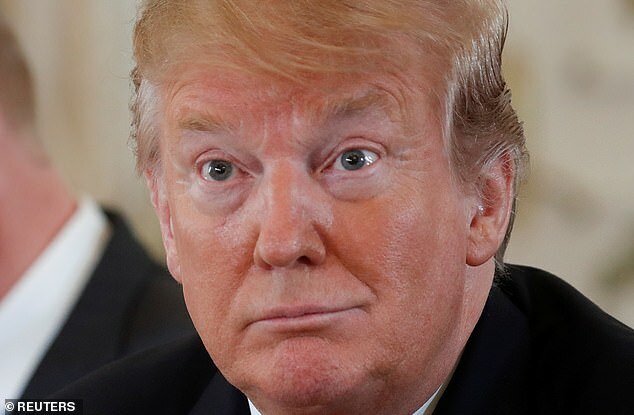 Earlier this month, Congress passed legislation voiding the president's emergency declaration, but Trump vetoed it almost immediately. Trump wants to use the declaration to shift $3.6 billion from military construction projects to erecting barriers along the border to keep his signature campaign promise. 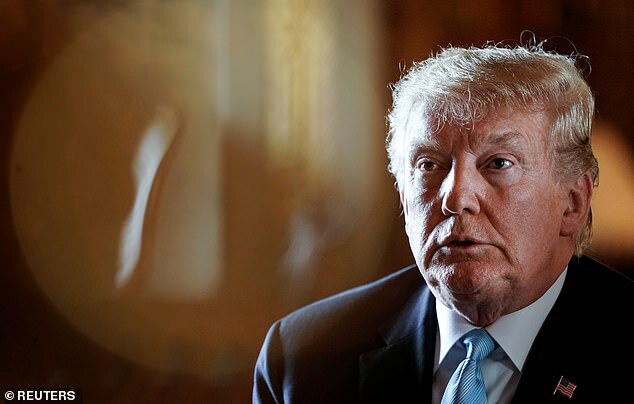 When Congress voted initially to block Trump's emergency declaration, it drew unanimous opposition from Democrats and opposition from some Republicans, especially in the Senate , where lawmakers objected that he was abusing presidential powers. But the battle over the president's emergency declaration is not over. Sixteen states, led by California, have sued the president to stop his move. Congress voted weeks ago to provide less than $1.4 billion for border barriers. 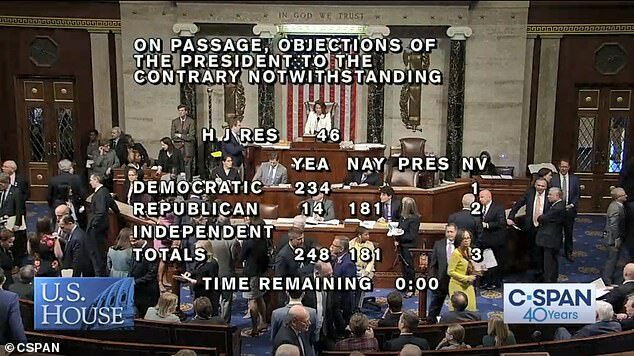 The House approved the resolution blocking Trump's national emergency declaration by 245-182 in February. 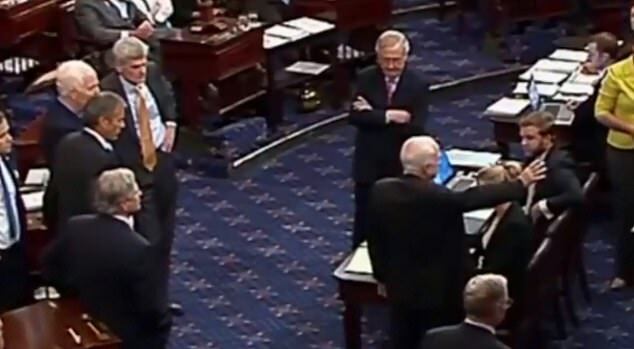 This month, the GOP-led Senate rebuked Trump with a 59-41 vote blocking his declaration. But since the House vote failed, the Senate won't attempt its own override and the veto will stand. 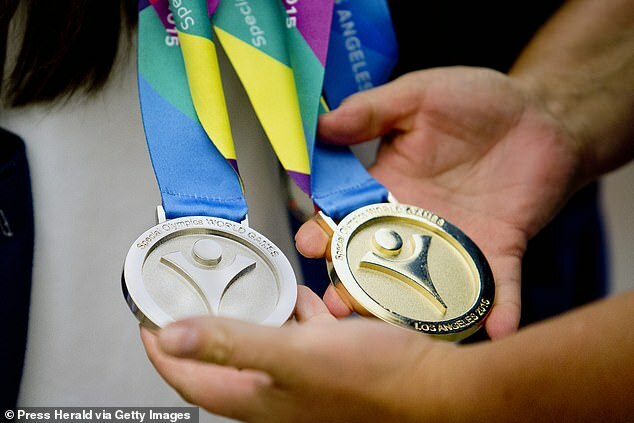 Special Olympics founder Eunice Shriver's daughter Maria Shriver described the called-for cuts "outrageous in every way"
President Donald Trump’s administration is again seeking to cut its funding for the Special Olympics — a move that met with vocal Democratic disapproval on Capitol Hill this week and which both the Kennedy family and some ESPN personalities also criticized. 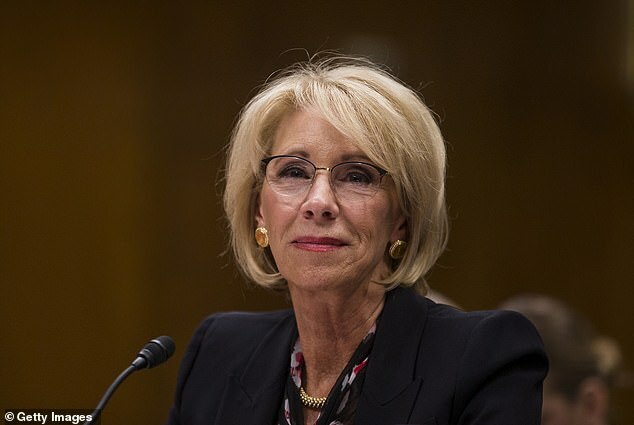 Education Secretary Betsy DeVos, under questioning from a Democratic representative on Tuesday, said she did not know how many children would be affected if the proposed $17.6 million cut went into effect. 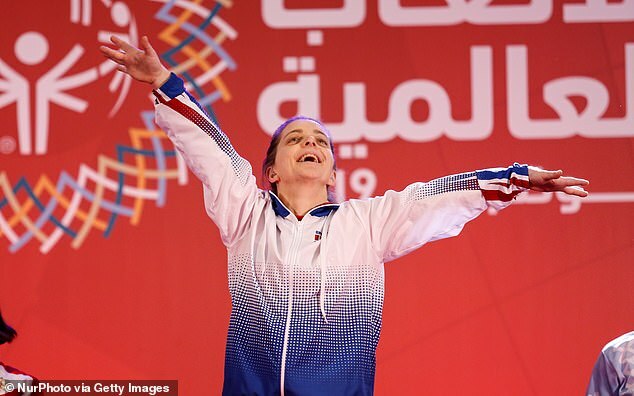 The Special Olympics — founded in 1968 by Eunice Kennedy Shriver, whose sister Rosemary had an intellectual disability — worldwide oversees more than 100,000 competitions for more than 5 million athletes with intellectual disabilities. The president has asked to cut about 8.5 billion, or 12 percent, of the Education Department’s budget for fiscal year 2020 in what an official described as a “desire to have some fiscal discipline and address some higher priority needs,” according to the New York Timesthis link opens in a new tab. However, a president’s budget proposal is just that: It requires Congressional approval — or Congress can ignore it entirely — and even Republican lawmakers have split with Trump over some of his requests. Last year they actually increased the Education budget. This year, with Democrats controlling the House, Trump’s budget faces even grimmer prospects. DeVos said the reductions were consistent with the proposed department-wide cuts. The budget would also keep “the same level of funding for core special education programs, including grants to states under the department’s Individuals with Disabilities Education Act,” CNN reports. On social media, some ESPN employees spoke out in dismay about the proposed slashing to the Special Olympics, according to the Washington Postthis link opens in a new tab. 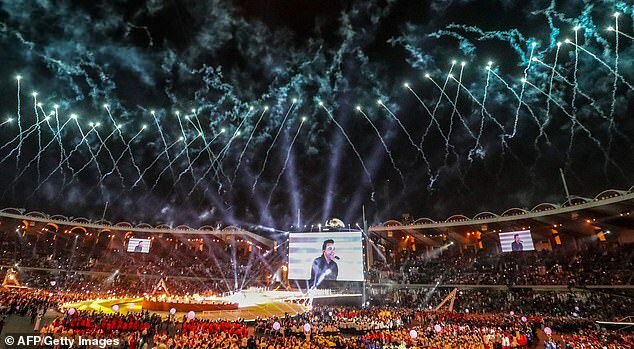 The network is the “global media partner” for the Special Olympics and, the Post reports, has aired its events for more than 30 years. Despite her support for funding cuts, DeVos has a personal connection to the Special Olympics: She worked as a mentor for the group, according to the New York Timesthis link opens in a new tab, and donated some of her secretary salary there last year. 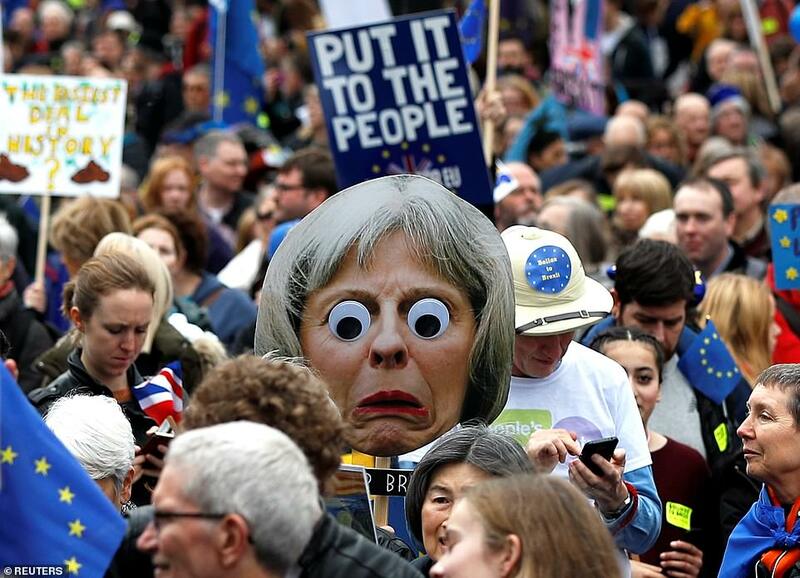 I am so sick of these f***ing billionaires crying crocodile tears over "having to make difficult decisions" about taking more and more from the rest of us! If DeVos loses one second of seep over this I'm the King of the World! Sickening, isn't it? Welcome to our world. 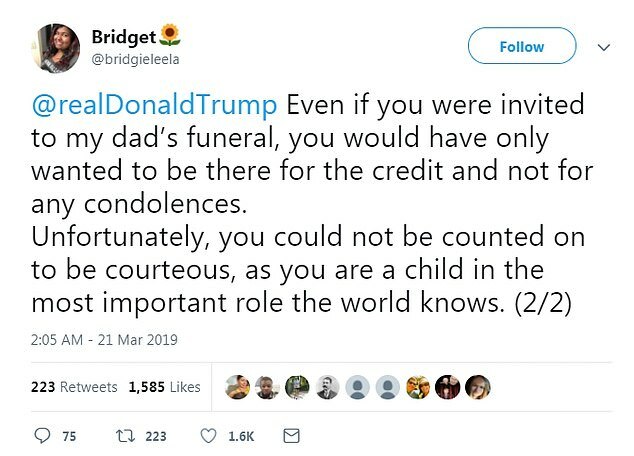 The only time any of these drumpf sycophants cares about anything is when it affects them directly - otherwise their attitude is "It's not my problem so fix it yourself". I had no idea. It’s shocking to me that this kind of barbarism still exists in the world. So glad George is bringing attention to this obscenity. The thing is, he's really speaking to the wealthiest among us. Most people can't afford to stay at these hotels anyway. And as one of the comments said after the last boycott, the only ones really hurt by the boycott were the hotel employees. 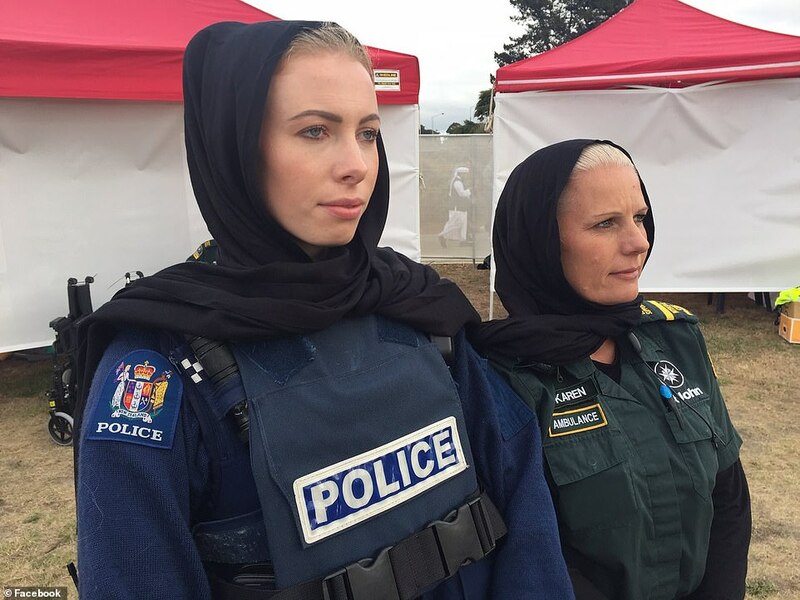 The policy in Brunei is horrific, but there has to be a better, more universal way to have an impact. It's political stands like this, that help me understand George Clooney's marriage to Amal. 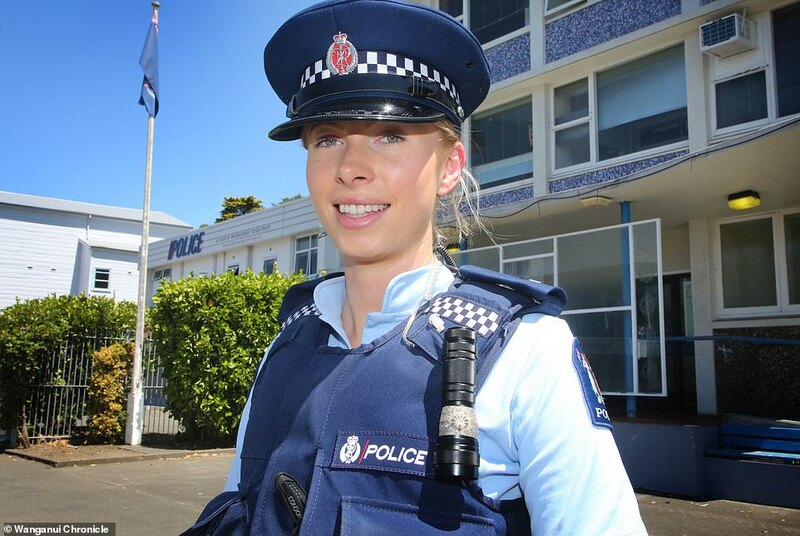 Their shared interest in cases like this make them champions of the LGBQT community. I think it was two years ago that this despicable man. the Sultan of Brunei brought in Sharia law - and I think there was a move then to boycott the hotels. I also remember reports of George possibly visiting Coworth Park near Ascot and not a million miles from Sonning. I thought it unlikely. 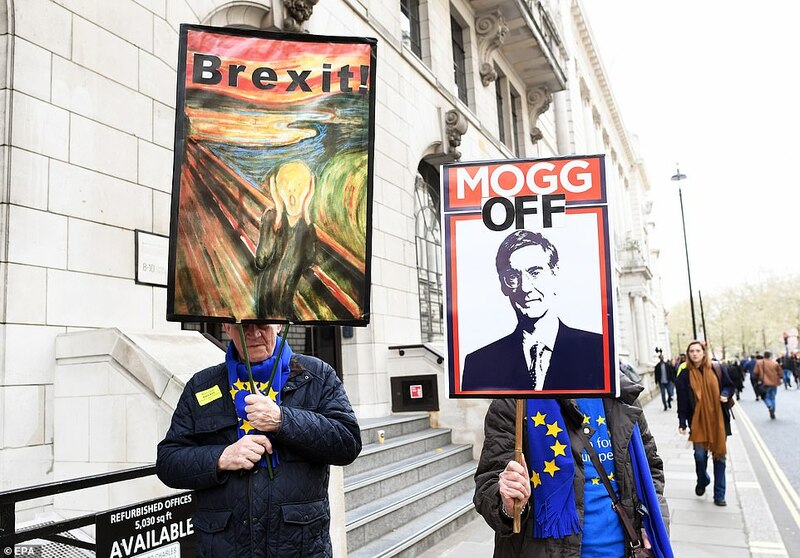 No doubt those of the same despotic nature will continue to go. 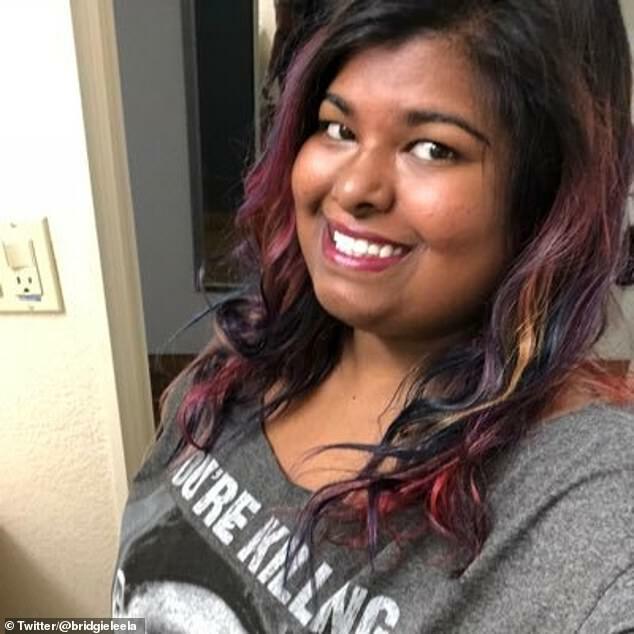 With all the Human Rights work Amal does for the LBGQT community world wide I'm sure she will continue to keep this front and center. Well, as George writes in his article he and others had boycotted the hotels a couple of years ago (which is what I remembered) and of course now it's known people will be stoned to death for being gay, he hopes to re-ignite the campaign again. 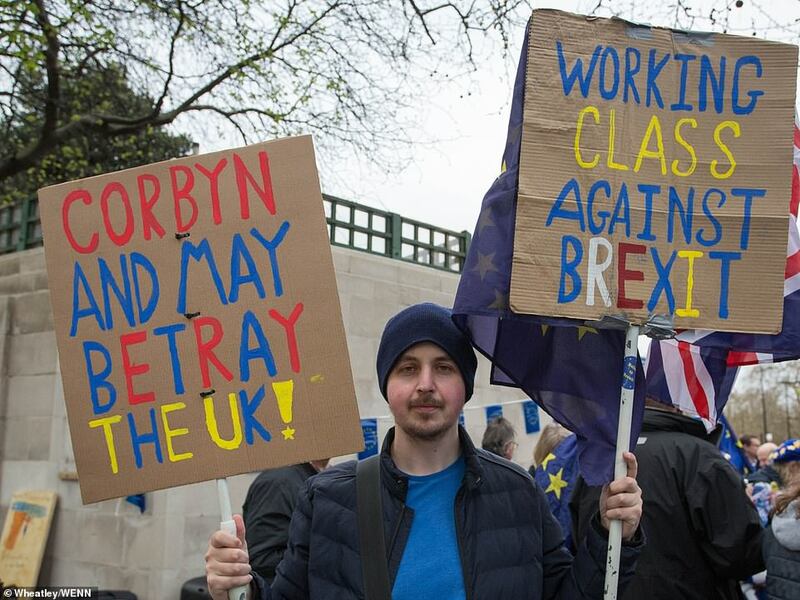 As he says, he has previously cancelled big events at these hotels in Hollywood, but hadn't realised quite how many there were worldwide and by mistake had stayed in a couple of them not so long ago. 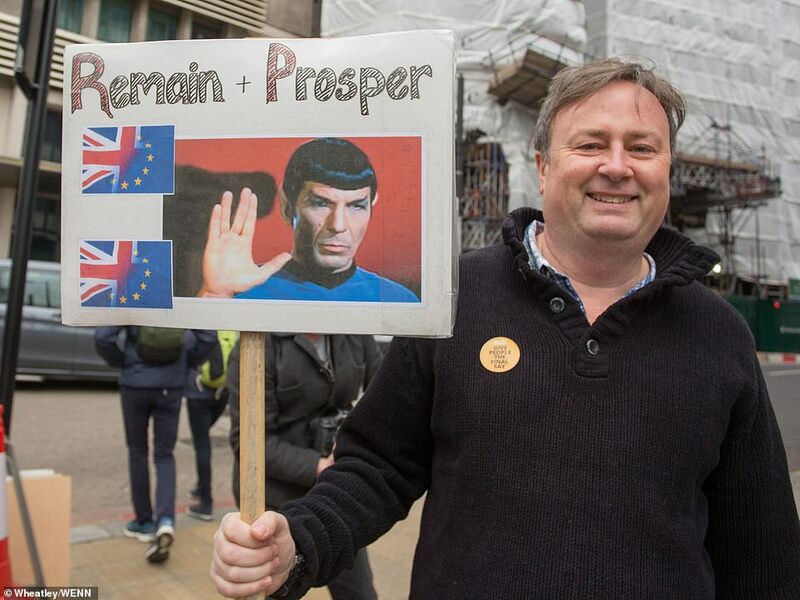 There's no doubt he will not be doing that again. Definitely agree PAN I've heard Amal champion the LGBTQ human right causes world wide and now Geroge Clooney is supporting Amal in her global effort. Nope. Wrong end of the stick, Ladybug. George has been supporting just causes like this from way before he met Amal. This was when he and Brad Pitt were involved in a stage play about Prop 8. Your right Pan I remember that Play , George has been involved with this cause for years well before he met Amal. This is also very much a human rights issue which George has advocated for as long as I can recall. George has always been very consistent in supporting human and civil rights. I just posted about it too on Chat thread....LOL. 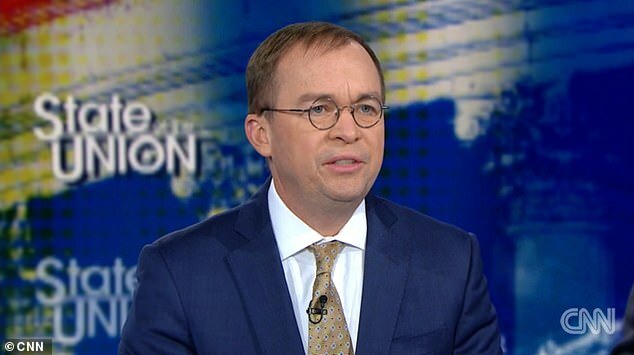 Acting White House Chief of Staff Mick Mulvaney said on Sunday President Donald Trump changed his mind about cutting funding for the Special Olympics when he 'realized the public wanted' the funding. He acknowledged there are policy disagreements among administration staff but said the final decision is always with the president. 'What you saw this week is the way the system is supposed to work, which is the president made the final decision,' he said. 'This is the president's budget. It's not the OMB budget, it's not the Department of Education budget, it's the president's budget,' he added. 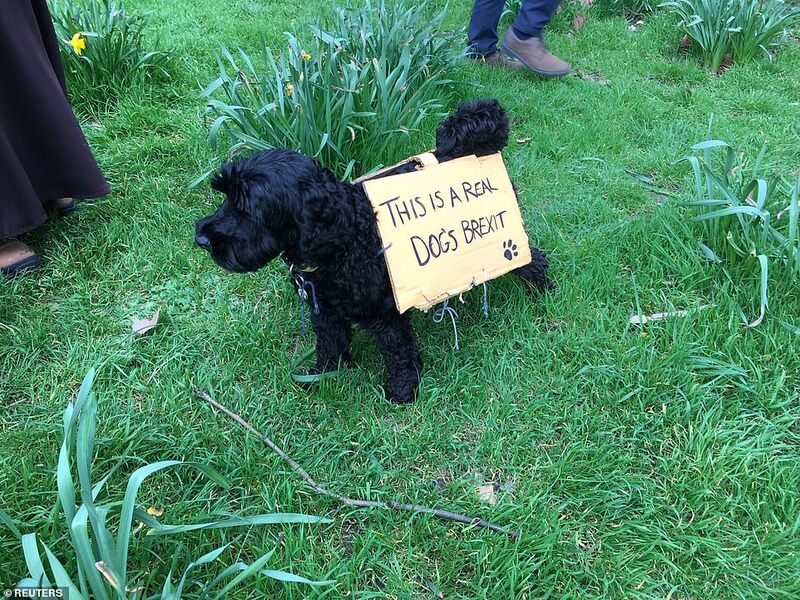 'We have real serious issues, real serious discussions about serious issues. The president makes the final determination. He wanted to make the change,' he noted. President Trump on Thursday said he reversed his administration's request to slash federal funding for Special Olympics grants. He claimed that he just learned about about the cuts that day and immediately withdrew the proposal to Congress to cut $17.6 million from the organization for athletes with disabilities. Education Secretary Betsy DeVos said earlier Thursday that she wasn't 'involved' in the controversial decision to recommend Special Olympics funding cuts, passing the buck. She suggested the White House budget office was behind the assault on the popular program. 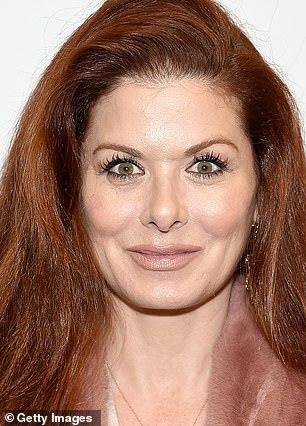 After Trump claimed his 'people' were responsible and he found out 'this morning,' she claimed once again that she wasn't culpable. DeVos suggested that President Trump and the White House are calling the shots when it comes to the administration's budget requests during testimony on Thursday to Congress. 'Whoever came up with that idea at OMB gets a Special Olympics gold medal for insensitivity,' he told her. DeVos came under intense fire on Wednesday from the family that created the Special Olympics and its most vocal backer in the U.S. Senate after she argued that the federal government should cancel $17.6 million in planned grants to the organization. 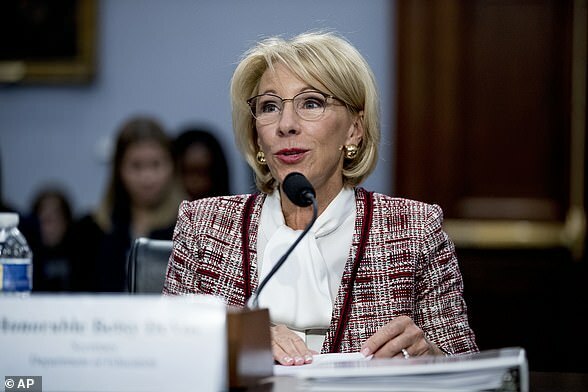 Detractors of the administration's request blamed DeVos, who among the biggest lightning rods in Donald Trump's Cabinet, for the line item in the Education Department's fiscal year 2019 budget. Her department cut 10 percent from last year's budget bring it in line with the president's penny-pinching goals. 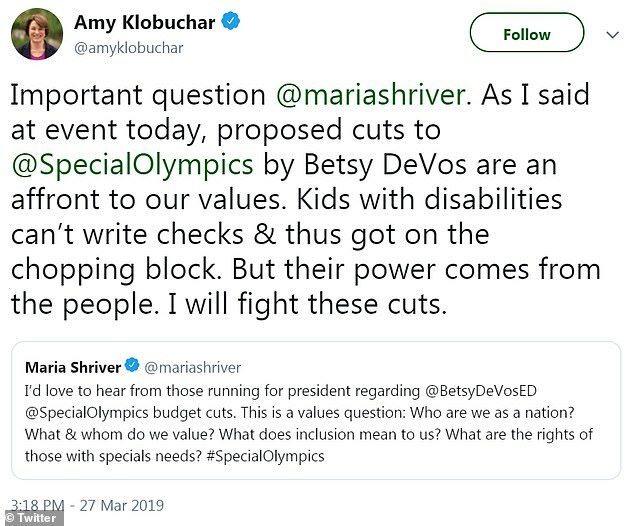 She said Wednesday her budget request included $13.2 billion to help states 'ensure students with disabilities have the resources and supports they need,' and insisted that the 50-year-old Special Olympics should be funded by private donors like most other non-governmental charities. 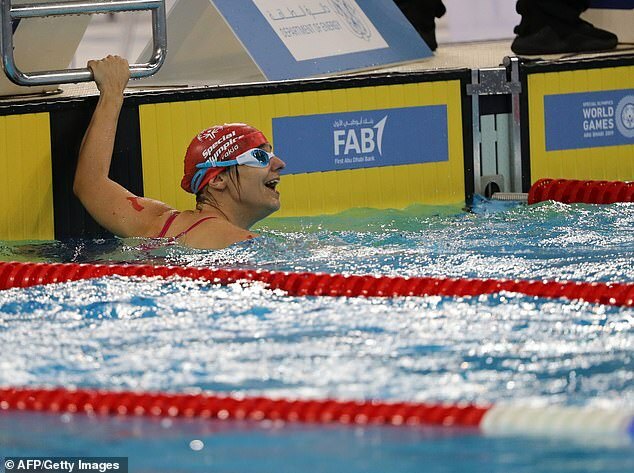 The Special Olympics 2017 annual report showed $144 million of income, including $113 million from individual, corporate and foundation donors. As she came under attack on Thursday in the U.S. Senate, the Cabinet official said she wasn't the one who recommended the cuts, throwing the White House under the proverbial bus. Sen. Roy Blunt, the chairman of the subcommittee she was testifying before, made it clear that he would not support cuts, pushing back on the executive branch request, as well. 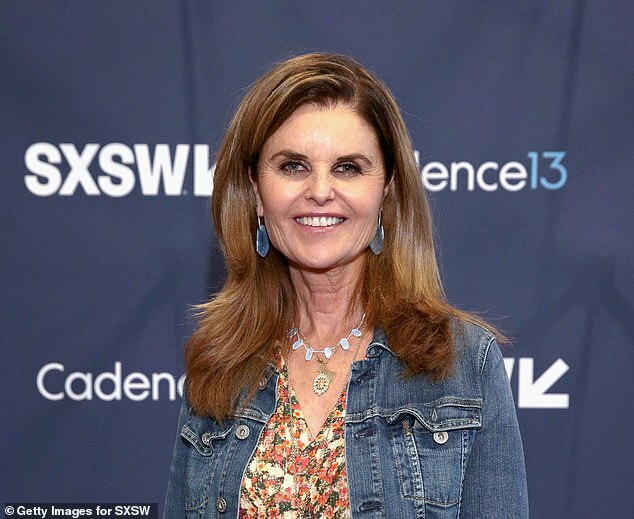 Maria Shriver, the wife of former California Gov. 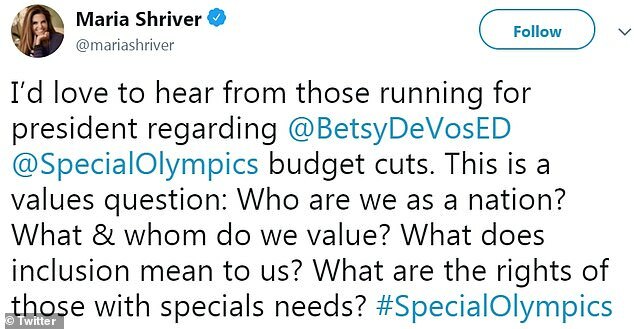 Arnold Schwarzenegger and sister of Special Olympics chairman Timothy Shriver, unloaded on DeVos in a series of tweets on Wednesday that fueled a bitter controversy over how much is enough. 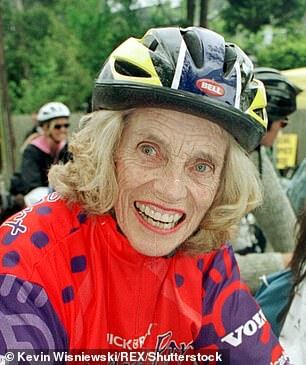 The Shrivers' mother, Eunice Kennedy Shriver, founded Special Olympics in 1968. 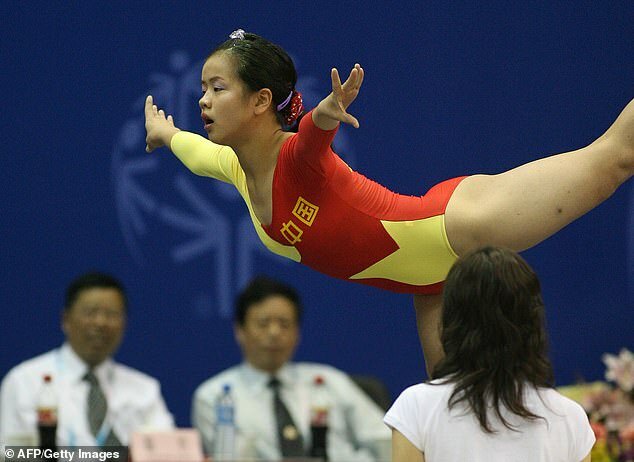 It's the world's largest sports competition for children and adults with disabilities. 'This is outrageous in every way. Let's let our voices be heard. No cutting @SpecialOlympics,' Mrs. Shriver tweeted. Zeroing out the $17.6 million in Special Olympics grants would save taxpayers roughty the same amount of money the government spends on five of President Donald Trump's repeated trips to his Mar-a-Lago resort club in Palm Beach, Florida. The Government Accountability Office reported in February that just those trips cost roughly $3.4 million each – approximately $1 million per day. 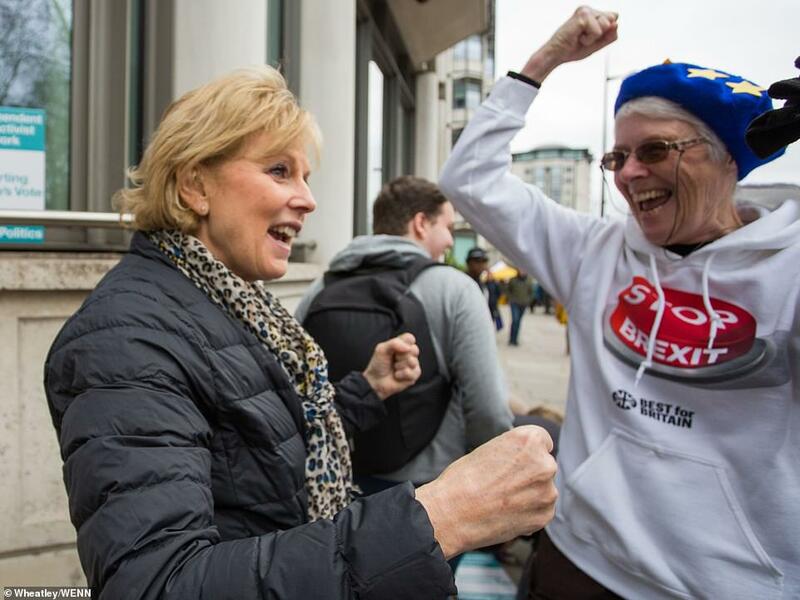 By mid-afternoon she broadened her outrage to flag Democrats in the race to challenge President Trump. Minnesota Sen. Amy Klobuchar, one of the Democratic 2020 hopefuls, swung hard. 'It is unacceptable, shameful and counterproductive that the media and some members of Congress have spun up falsehoods and fully misrepresented the facts. 'Make no mistake: we are focused every day on raising expectations and improving outcomes for infants and toddlers, children and youth with disabilities, and are committed to confronting and addressing anything that stands in the way of their success. 'The President's budget reflects that commitment. It supports our nation's 7 million students with disabilities through a $13.2 billion request for IDEA funding, the same funding level appropriated by Congress. All of that money goes directly to states to ensure students with disabilities have the resources and supports they need. The budget also requests an additional $225.6 million for competitively awarded grants to support teacher preparation, research and technical assistance to support students with disabilities. 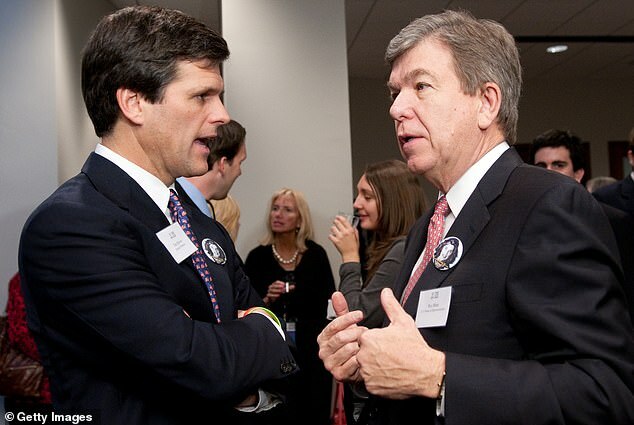 Blunt vowed on Wednesday to block the de-funding request in the Senate's final budget. 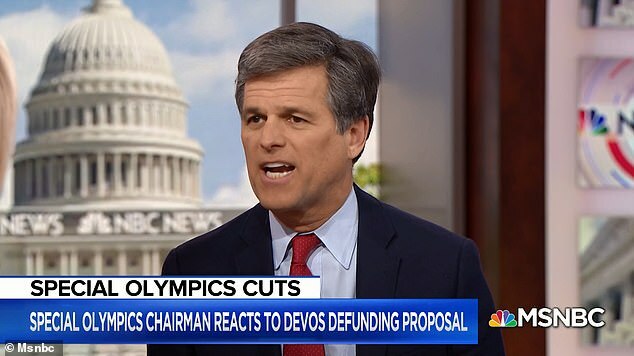 Timothy Shriver told MSNBC on Wednesday that without the federal government's money his organization would have to discontinue 'what we are doing in schools to end social isolation' for intellectually disabled students. 'We just disagree,' he said of the administration's proposal. 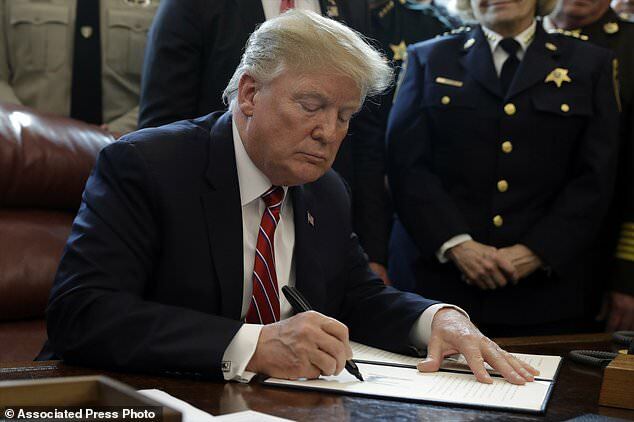 According to Connecticut Democratic Rep. Rosa DeLauro, who chaired the subcommittee hearing on Wednesday, the three education budgets written by President Trump's administration have proposed the largest cuts to education funding since the department's creation in 1979. 'How can you support this budget? 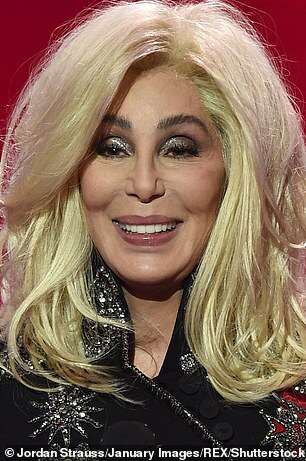 I mean that genuinely,' she said. The latest Education Department budget proposal includes a $2 billion reduction for Pell Grants, along with billions more for about 30 other programs. It already had a slim chance of being approved by Democrats who control the House of Representatives.